Just like their engagement session in July, Tori and Michael’s wedding day was the perfect temperature with no clouds in the sky. Their families and friends gathered at Revel on a Monday afternoon in April to see them become husband and wife. I knew when I first met with Tori and Michael that some of the details of their wedding would be a little different from what I’ve seen before, and all the details were so unique and well-coordinated when I saw them in person. They had a yellow and gray color scheme; the bridesmaids wore gray maxi skirts and the groomsmen wore yellow suspenders and bow ties, all with black Converses. 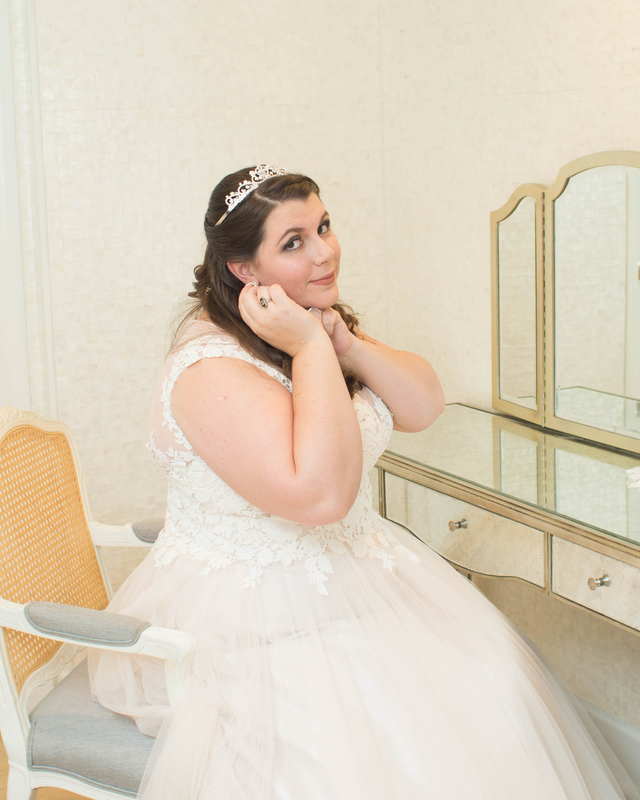 Tori’s long-sleeved lace and tulle gown was straight out of a fairy tale wedding, with a cotton crown she made herself and yellow Converses to match Michael’s—the same ones they wore with their black and white outfits at their engagement session. Instead of bouquets, Tori and her bridesmaids carried lanterns with cotton and string lights inside. The tables had cotton centerpieces and their favorite yellow candies. 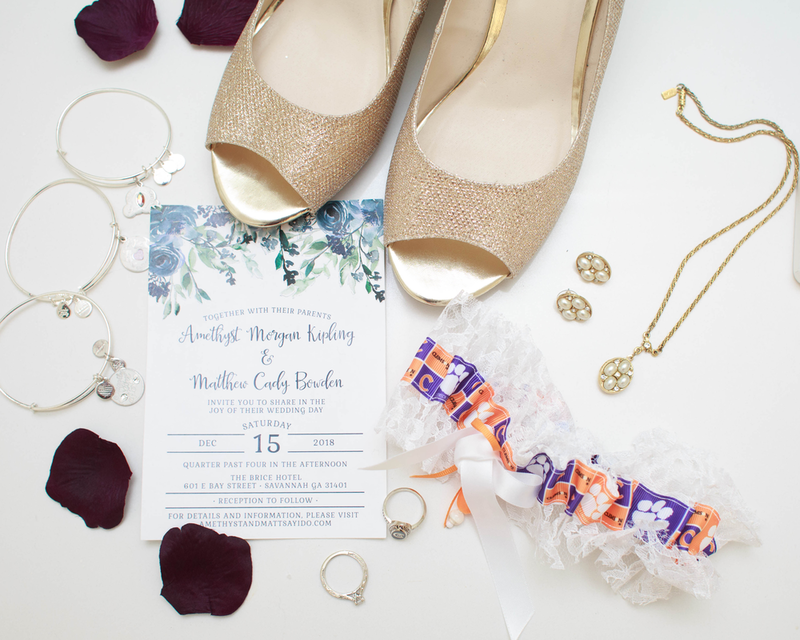 For the reception, they picked out breakfast food, because “who doesn’t love breakfast food?” As a couple who met during Governor’s School and graduated from Clemson, they had all of their rings present for their detail shots. Their “guest log” was cut from an actual log where all their guests could sign. You could see that Tori and Michael were so happy for this day to finally be here. They were so smiley for their portraits, which makes it easy for me! It’s been so much fun to be part of their engagement and their wedding day over the past year or so. Everything else was made possible by family and friends. The one snow day we had in Greenville all winter just so happened to land on the day McKenzie wanted to propose to Katrina. The exciting night out he’d planned for the proposal quickly turned into a night in, so he had to think of a new plan quickly. He put on “Millionaire” by Chris Stapleton and asked Katrina for a slow dance in the living room. When the song finished, he told her that it was a good time to celebrate. Wen Katrina asked what they were celebrating, McKenzie said, “our engagement,” and got down on one knee with this gorgeous vintage-looking engagement ring. 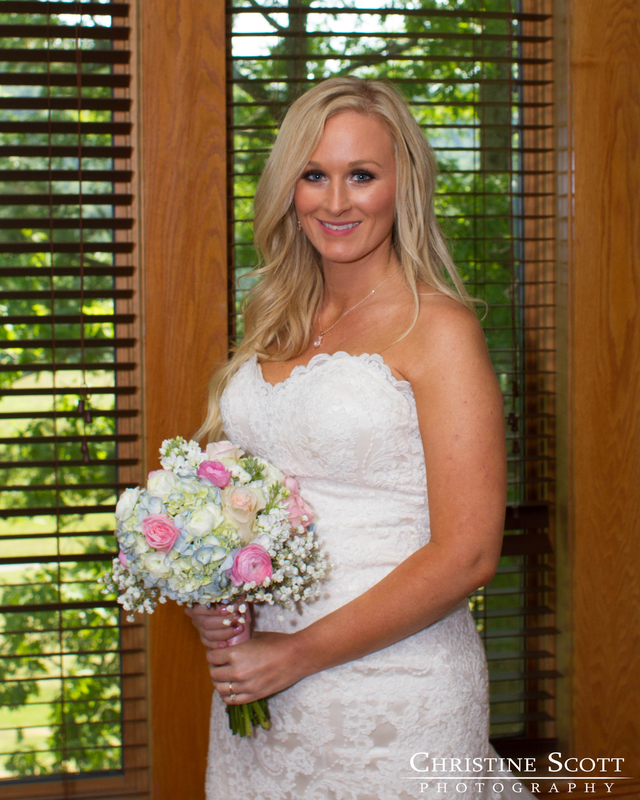 Katrina and McKenzie’s intimate wedding was on a perfect April day at the Bleckley Inn in Anderson. They made each other laugh during the ceremony and they had me laughing so much during their bride and groom portraits! We took some photos out in the courtyard and some others in this little alleyway with flowers and string lights. Katrina wore a gown with lace sleeves and an off-the-shoulder V-neckline, like a gown out of a 50s movie. She also had these princess-looking shoes and the garter her mother wore on her own wedding day. 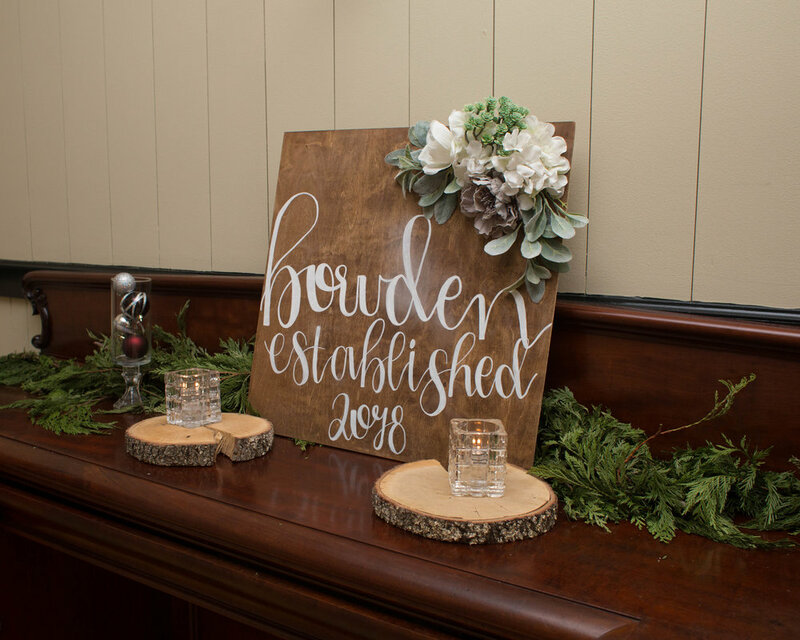 Many of the items they used were handmade, including their engraved tree-like ring box, McKenzie’s feather bow tie, and the succulent décor at the reception. All three of their rings are so unique—McKenzie’s wedding band is made from meteorite! Thank you Katrina and McKenzie for letting me be part of this beautiful day! 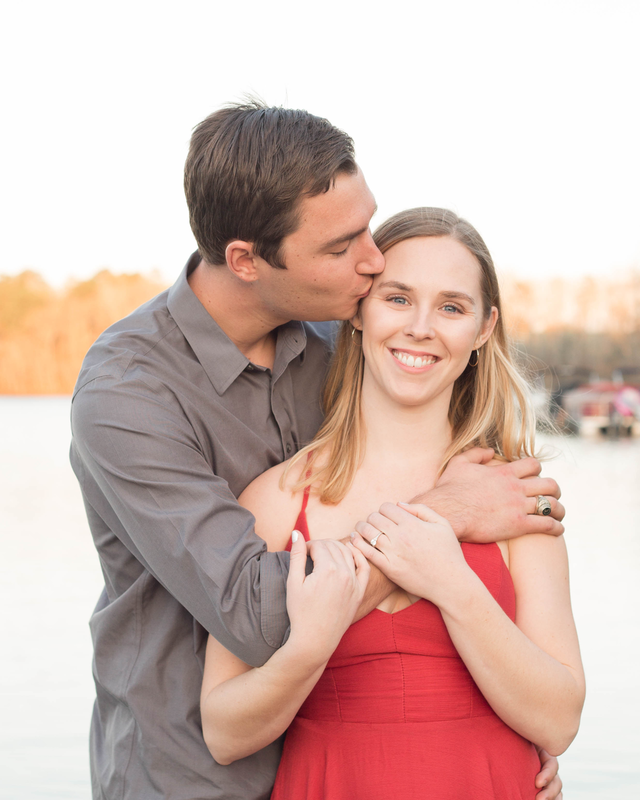 Lindsay and Tim met through the engineering program at Clemson. They became friends when they both had their engineering co-op with the same company and they started dating not long after that. 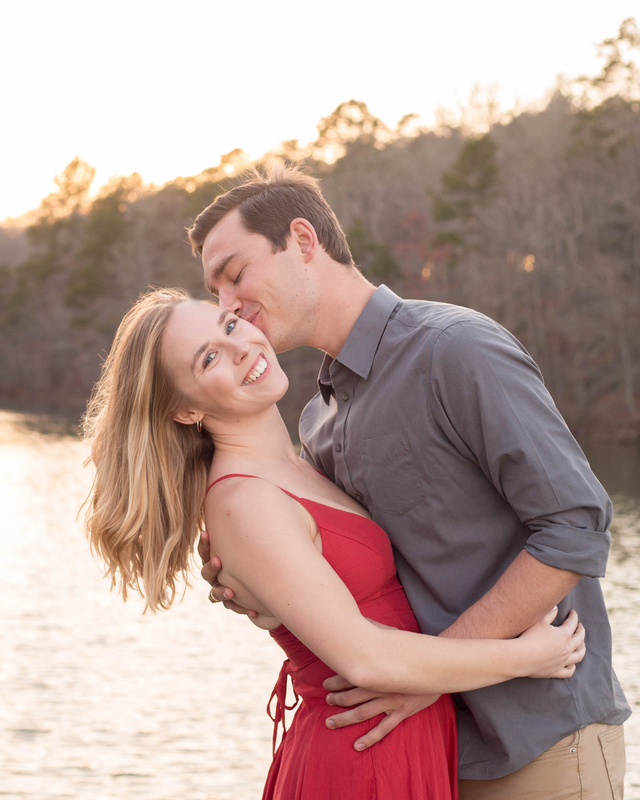 For their first date, they went paddle boarding on Lake Hartwell, right outside their apartment community. While they were on a ski trip to Colorado, Tim proposed to Lindsay on a horse-drawn carriage! How sweet is that? Since Clemson is such a special place for Lindsay and Tim, they decided that was where they wanted to do their engagement photos. They came down from Charlotte with their sweet puppy, Ray. We started down by the stadium and worked our way through the main part of campus. Since legend has it that walking hand-in-hand through President’s Park guarantees that you’ll be together forever, it’s pretty much a milestone in any Clemson couple’s relationship, and we had to get some pictures in there. This session wouldn’t have been complete without going to Harts Cove and taking some pictures at the docks on Lake Hartwell, where they had their first date. Since the students were on spring break, the campus was nearly silent for a Friday evening, making this session more peaceful and intimate. It was the perfect spring day; the temperature was in the upper 60s, the sky was clear, the trees were pink and white, and there were so many colorful flowers in front of Tillman Hall. The bigger trees were still bare enough for that glow you only see in the winter, and to show Tillman Hall in the background when we were at Sikes Hall. Enjoy the photos from this beautiful spring evening! 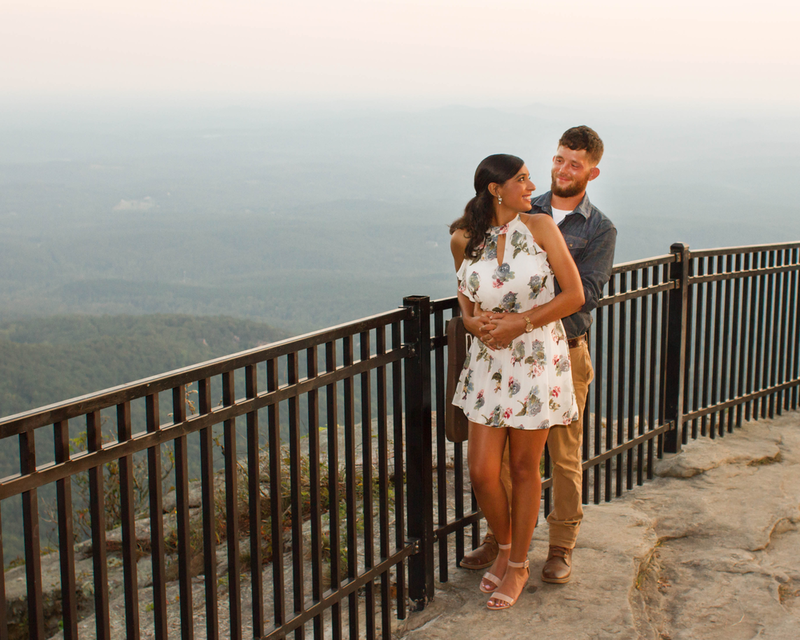 I can’t wait for their fall wedding in the mountains! 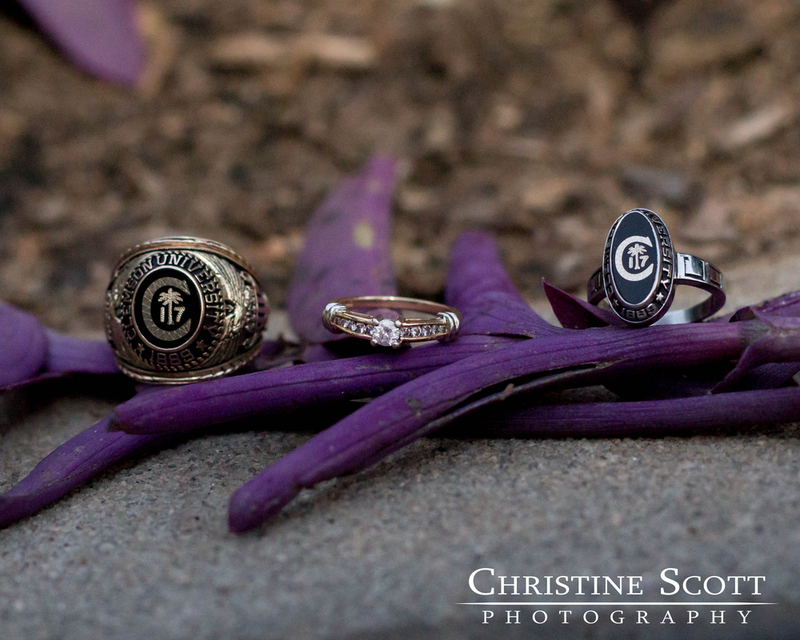 To see more Clemson engagement sessions and other work I’ve done around there, visit my Clemson page. Just a few days before the Miss Clemson University pageant, Anna was on the sidelines with the rest of the Rally Cats dance team as Clemson won the 2018 College Football National Championship. After a super cool Michael Jackson jazz dance, the most picturesque entrance in her evening gown, bringing in the most ad sales, and taking home the philanthropy award, Anna was crowned Miss Clemson University 2019. 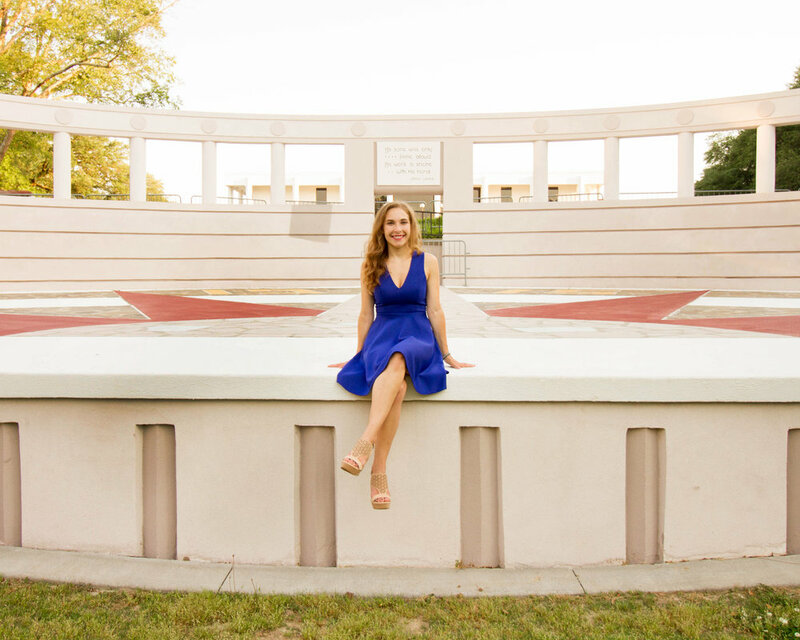 She represented Alpha Delta Pi. Not only does Anna come from a family with lots of Clemson Tigers, her great-aunt was the very first Miss Clemson College in 1962! It’s actually a pretty big decision and I don’t know why I’ve never read a blog post on it. I never heard anyone talk about this, and I never thought to talk with anyone about it, maybe because everyone has such different views on marriage in general and what different name change options would say about you. Even when you Google “name change after marriage,” the whole first page is about the process of changing your name and not what to change it to. I’m sure I’m not the only one who would have benefitted from reading something like this. I initially didn’t like the idea of changing my name. This is what I had been called my whole life. I didn’t want to be called something else just because I made the decision to get married. Changing my name would mean having to update everything from my driver’s license to my Amazon shipping information to my paperwork at my job. I really didn’t want to go through all those processes, in addition to having to update pretty much everyone I knew. The reason I did change my name was because I wanted our eventual family to all be under one name. “The Gows” wouldn’t include me if my last name was Scott or Scott-Gow. People wouldn’t know to associate me with Dan or our future children. So I eventually decided that I wanted to be a Gow, but what would come between Christine and Gow? For other people, there are several factors to consider. I know professors who didn’t change their names so they can still be tied to different works they’ve published. Other professors might marry another professor in the same department and not want to be confused with each other. Some use a hyphenated name. One of my professors made her husband’s last name her middle name instead of the other way around. Some people change their name, but still choose to be known professionally as the name everyone knows. Carrie Underwood, for example, is not known to the public as Carrie Fisher, partially because so many people know her as Carrie Underwood, and partially because she could be confused with Princess Leia. After deciding what your last name will be, you have to decide what you want your middle name to be. For some people, it’s an easy choice if they don’t like their middle or last name, or if it’s a name that they don’t want to be associated with anymore. I like my middle name and I didn’t like the idea of completely replacing my family name. 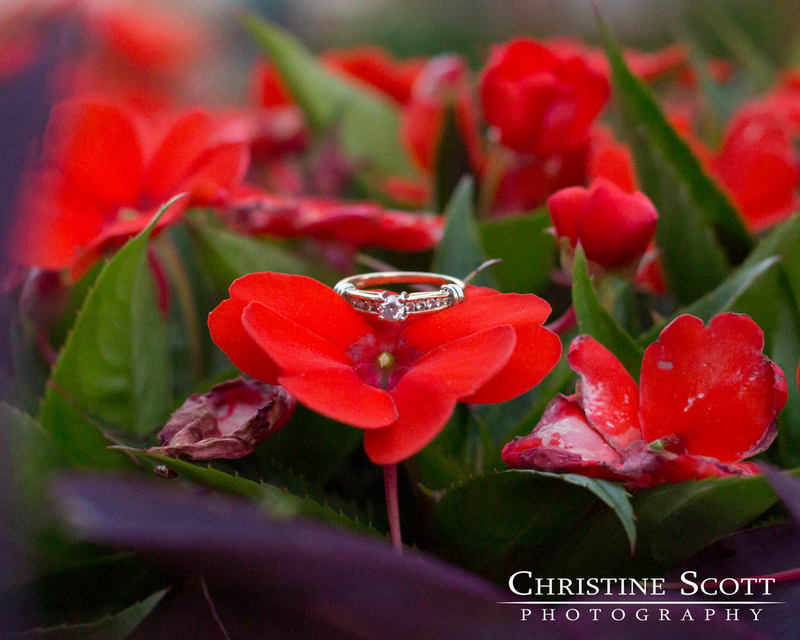 Plus, I had Christine Scott Photography going for me, but it would be weird if Scott wasn’t part of my name anymore. I don’t think I really knew what I wanted my middle name to be until over a month after I was married. This brings me to the legal process of name changes, which can vary by state. In South Carolina, you can change your middle and last name to reflect your spouse’s name after becoming legally married. Based on those rules, my options were Christine Laureana Scott, Christine Scott Gow, or Christine Laureana Gow (side note: Laureana is pronounced Laurie-Anna and it was my great-grandma’s name). Somehow, I got away with making “Laureana Scott” my legal middle name without anyone questioning me. I don’t know what my plan would have been if I’d been told that wasn’t allowed or if I didn’t have enough space on the form. Here’s where it gets complicated: if you don’t go by your first name, you will need a court order to legally change your name to the one everyone calls you. This applies to people who go by their middle names, their last names, a nickname, or just another name they’ve chosen for themselves. According to the South Carolina Legislature’s website, “A person who desires to change his name may petition, in writing, a family court judge in the appropriate circuit, setting forth the reason for the change, his age, his place of residence and birth, and the name by which he desires to be known,” as well as a series of background checks and an affidavit. If monograms or initials are important to you, that’s something you’ll want to think about before making a legal name change. Remember the Big Bang Theory episode where they name their teams “Perpetual Motion Squad” and “Army Ants,” not realizing what the acronyms would be on their shirts? Or what if your initials don’t spell anything, but your monogram does? As for initials, I always thought “Christine S” sounded weird, maybe because it was rare for me to need to be distinguished from another Christine, so “Christine S Gow” sounded weird to me too. The only times I see “Christine L Gow” are in places like my bank account. My signature is “Christine L Gow” because that’s what my credit card says and my signature is on the back. On a side note, Dan and I recently realized that the “G” looks different in our signatures. His G looks like the one on the General Mills logo and mine looks like the one on the Goody hair accessories logo. There are online services that will automate the process for you. I considered this since the DMV here wasn’t open when I wasn’t at work, but I read some negative reviews about the online services and decided I didn’t want to risk my legal name getting messed up. I read that you’re supposed to go to the social security office before the DMV, so that’s what I did once I had a day off work. I believe I was required to bring two forms of ID, which can include your driver’s license, your passport, your social security card, and your birth certificate. I got there right when it opened and there was already a huge line across the front of the building. I had some photography work to do, so I brought that with me in anticipation of a long wait. The wait at the social security office was actually longer than the wait at the DMV, but I was able to sit down right away at the social security office. I hope this has provided some insight to you as you get ready for this big change! In 2018, I had sessions or weddings across 6 states. From fulfilling my lifelong dream of meeting Piglet in Disney World to adding beautiful Kentucky to the list of states I’ve been to, it’s been pretty exciting. There were pink and white trees, green trees, red and yellow trees, and trees with lights in them. I shot in Falls Park on the day of prom and right when it stopped pouring down rain after 4 days. It’s been a year of growth for my business, but I’ve also been lucky to keep shooting for other incredible photographers in the area. First of all, my aunt Diane helped me come up with a new logo last week. My original logo was meant to be pretty versatile because I wasn’t totally sure what I wanted to focus on. Once I got a better idea of what would better reflect the work I do, I changed the font and formatting to reflect that a little better. I kept the same colors I’ve always had, partly because I just like them, and partly because I’ve come to like the elegance of navy with a hint of a bright green that you wouldn’t normally see at a wedding. I’ll be starting off the year with Miss Clemson University on January 12th. This will be my third year with the pageant and I can’t wait to meet the new winner and have a session with her! I’ve had a few headshot sessions this year and I’ve realized how much I enjoy them! This will become a service that I regularly offer. 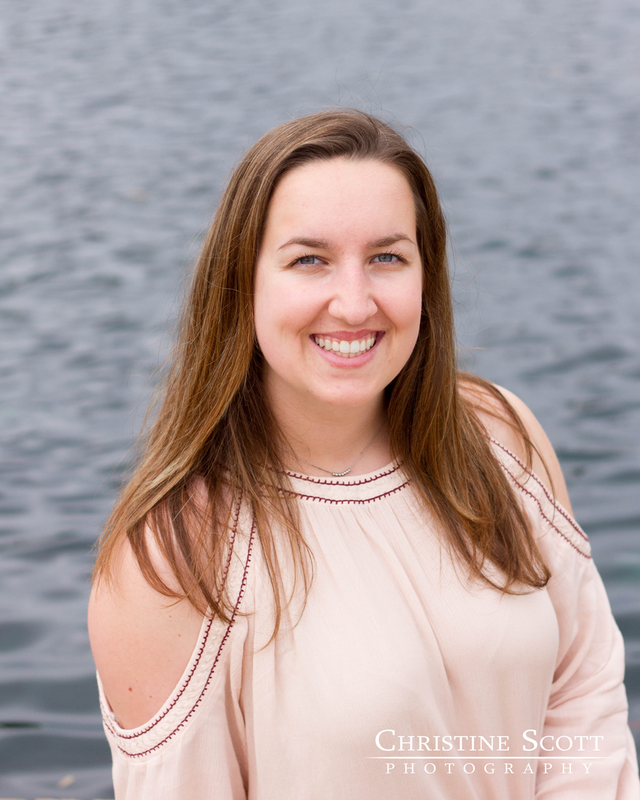 It’s important for professionals, small business owners, and pageant contestants to have updated, high-quality photos of themselves so people can become more familiar with the person they’re about to get to know. Just like with a portrait session, I’ll help you decide what to wear and how you want your hair and makeup so you can look and feel like yourself. Since this will only be a 30-minute session, I can have these sessions during the week in Greenville! In the past year, I’ve become more passionate about helping people learn to take better pictures because it’s a skill anyone can benefit from. You don’t have to be an aspiring photographer to take advantage of this. This can help you if you want to have a picture of your cute kids before they grow up, you want to show better photos of a product you want to sell, or remember a pretty place you went to. To let me know you’re interested, join my mailing list and you’ll be the first to know when I have something new to share! You’ll still have a complementary engagement session with your wedding, but there are a few things I’m excited to expand: bridal portraits, albums, and prints. As someone who’s been through wedding planning and continues to be part of it from the vendor side, I think it’s important to use my experience to help your first day of marriage go as smoothly as possible. Part of that is to make you feel comfortable with me before the big day comes, and part of that is to help you build your relationship with each other. Here are a few of my favorites from 2018. Here’s to what comes next year! 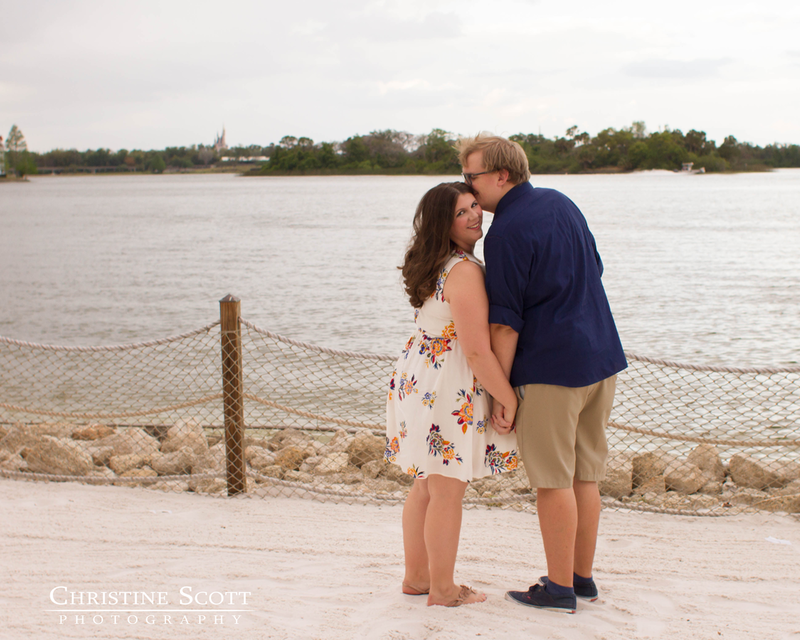 Remember Amethyst and Matt, who had their engagement session in Disney World this past April? 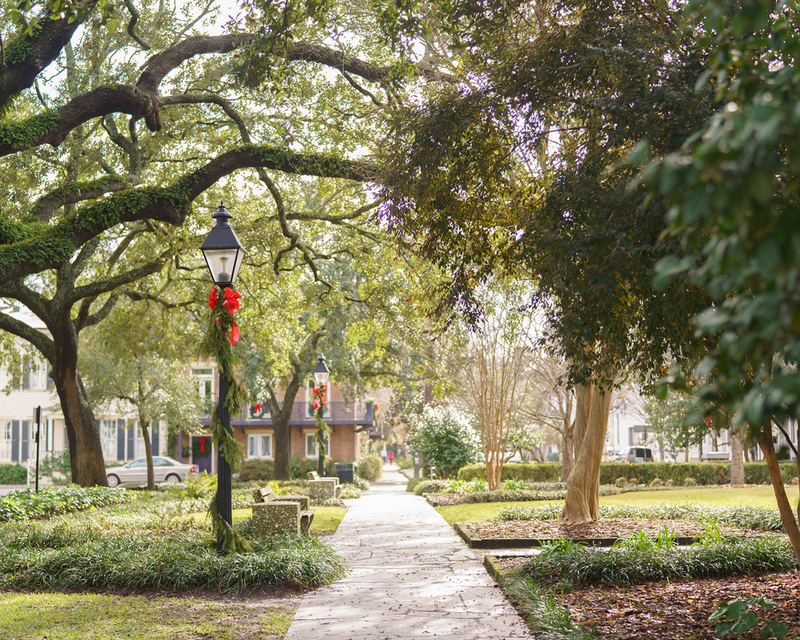 They celebrated their happily ever after on a warm and sunny December day in Savannah, Georgia! My day started with a Forrest Gump impersonator chatting with me at breakfast and telling me to congratulate the couple for him, which I think is pretty cool. The day ended with a sparkler exit along the street with trolley passengers cheering and passing cars honking. Before the ceremony, I took pictures with Amethyst, her family, and her bridesmaids with ivy and palmetto trees. My second shooter, Shain, took Matt, his family, and the groomsmen to the nearby square with lots of giant oak trees and Spanish moss. 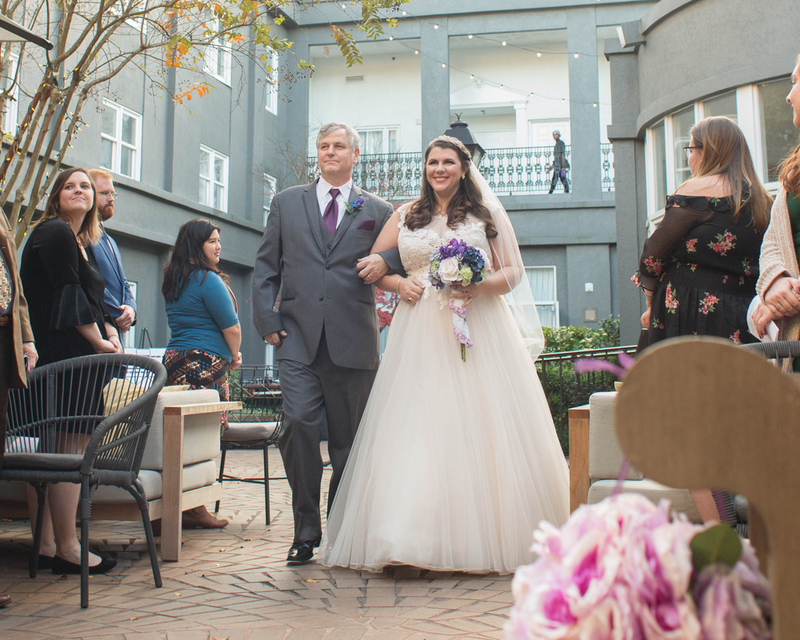 The ceremony took place in the courtyard of the Kimpton Brice Hotel, which faces the Savannah River. Although this was not a Disney-themed wedding, there had to be Disney references throughout the day, since that’s where Amethyst and Matt met and began their adventures as a couple. Not only were there some Disney songs carefully placed throughout the day (I especially loved the songs from The Goofy Movie as the wedding party entered the reception), each entrance into the reception space had a Disney quote about love on it. Like any Disney princess, Amethyst wore a tiara. Since Beauty and the Beast is one of Amethyst’s favorite Disney movies, Matt had notes and roses given to her throughout the day. As we took their photos in the square after the ceremony, Matt gave her one more note and a rose. I only know that part of that note said “I’ll love you until the last petal falls” because Matt pointed out that this rose was artificial, so no petals would fall. 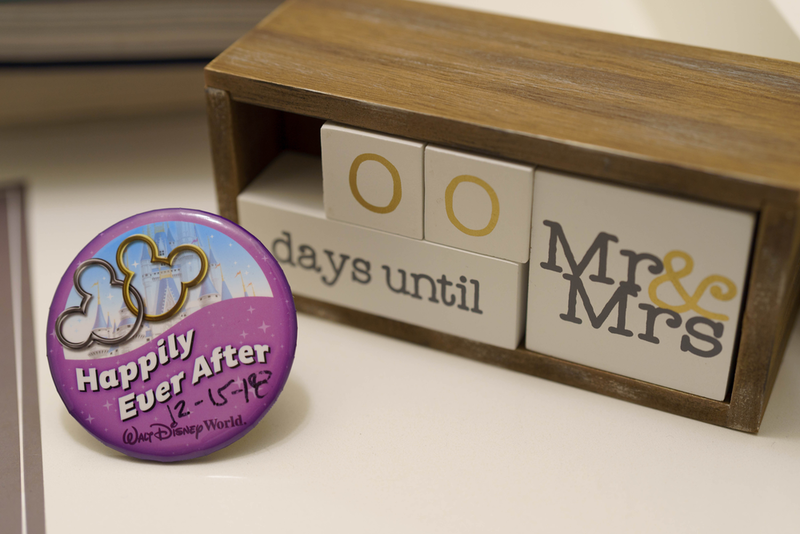 When you’ve spent years working at “the happiest place on earth,” where do you go for your first adventure as a married couple? Well, “the happiest place on earth” actually refers to several places in different parts of the world, so I’ll just leave it at that. Here are a few of my favorites from this beautiful wedding day! While I love all the excitement and details of a wedding day, engagement sessions are unique in their own way. Not only is it intimate, it also gives couples a chance to showcase their personalities and stories through the location and outfits they choose. In this blog, I’m sharing a few tips on what to wear! I believe that photos that make us happy are mostly because of how we feel at the time the photos were taken. I want everyone to feel their best before they even see me, so I give everyone a portrait guide before each session. Much of that gives some insight to help you decide what to wear. I recommend having two outfits, but some couples choose to wear one, either because they really like it or because they don’t want to take time out of the session to find a place to change. Here are a few tips to help you narrow down your options. 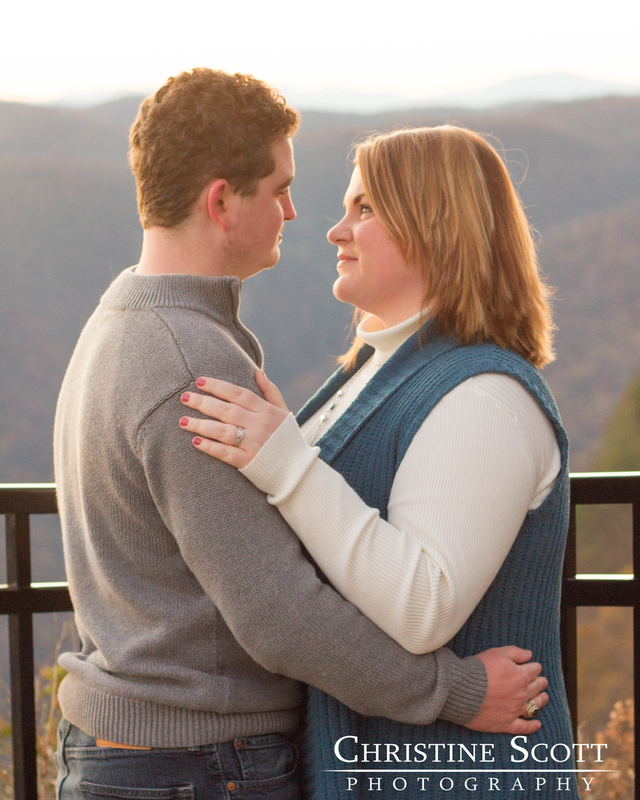 You don’t want to remember your engagement session as the day you wore a top that was too tight or an itchy sweater. If it’s 100 degrees, try to wear something that’s won’t make you sweat more. If it’s 25 degrees (like in Katherine and Anthony's session, pictured above), make sure you have layers under your outfit and gloves to put on between photos. A scarf and a peacoat can be just as pretty as a sundress. Check out my Pinterest board for some of my favorite outfits for cold weather sessions! Wear comfortable shoes! Take it from me: after I finished my graduation session, it was about a half mile walk back to my car. I really didn’t want to make the choice between wearing the shoes that hurt me for the whole session and walking barefoot. If you’re dying to wear a certain pair of shoes for your session, make sure you have a more comfortable pair to change into if you have a lot of walking to do. Here’s a tip that I picked up from my high school color guard days: carefully placed electrical tape on the insides of your shoes can save your feet a lot of pain. 2. Coordinate with each other. You can coordinate outfits without matching, like the “red top, black pants” my cousins and I would wear for our family pictures at Christmas when we were little. You could choose a color scheme, such as wearing different shades of blue or both of you wearing something red and black. You could also complement each other’s outfits. If your favorite dress is purple and your fiancé doesn’t have anything purple, you can choose an accessory in a similar color to something he does have. You can coordinate your outfits with the color scheme of the location. If there are lots of fall leaves at this location, you could wear warmer hues to complement them. If your session is in the snow (which would be amazing), you could wear bolder colors to stand out. 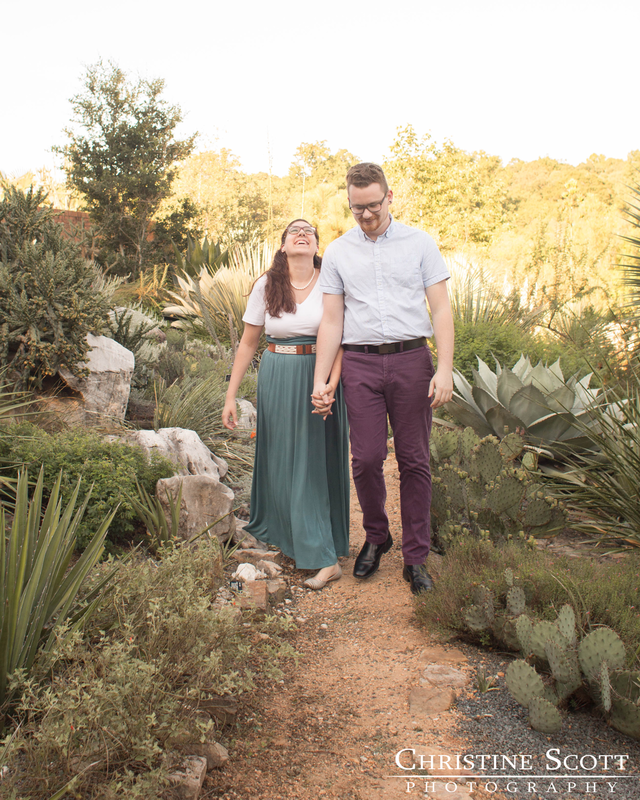 Tori and Michael’s first outfits complemented the colors of the desert garden so well, and their second outfits showed off their matching shoes while coordinating with the sunflowers. If you’re newly engaged, I hope this helps you feel more confident going into your engagement session! Want to be one of the first to see my next blog post for couples? Click here to join my email list! 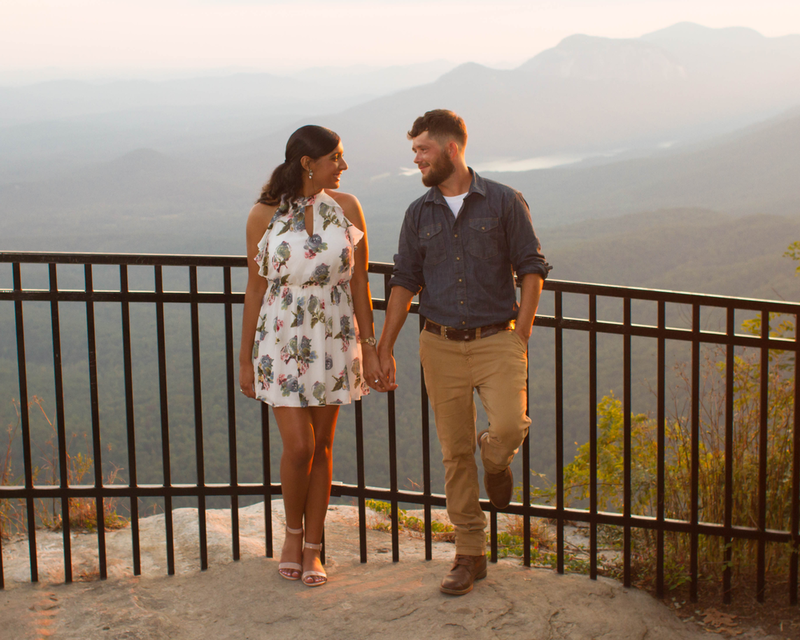 I have a lot of pictures to take in the wonderful month of October, and the first were for Sierra and Remington’s engagement session in the mountains! 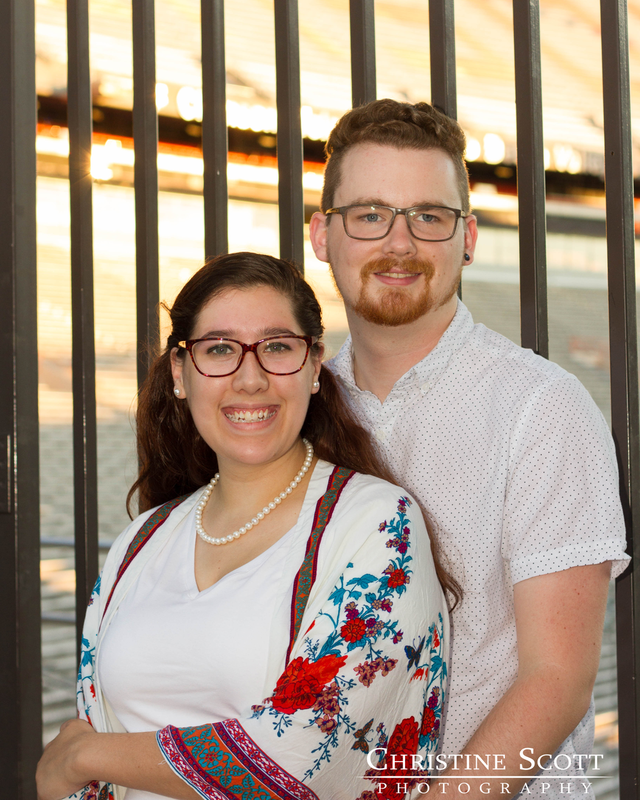 When I first met Sierra and Remington in July for Sierra’s graduation photos at Clemson, they told me they were about to celebrate their 4th anniversary as a couple. Right before that day came up, Remington told Sierra to make sure her trunk was shut because he got something out of it earlier and he wasn’t sure if it had closed all the way. Thinking he was at work, Sierra opened the trunk to find three boxes with letters and pictures of them together. Remington came from behind the house and proposed! 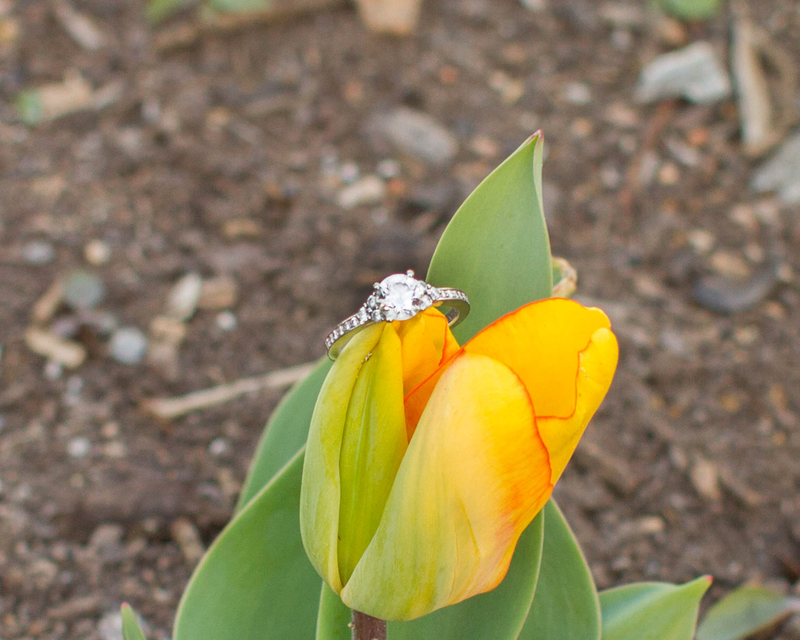 How pretty is the ring he picked out? And yes, I looked all around for red and yellow leaves before Sierra and Remington got there so I could do a fall-looking ring shot, even though it was still a few days before the fall temperature kicked in. I’ve found that people in other states tend to forget that there’s more to South Carolina than Charleston, but Charleston doesn’t have a view like this! Check out some of my favorites from this session with an awesome couple in a beautiful place. Seeing your images for the first time is always such a fun experience, but deciding on what to do with the images can be difficult. You probably value being able to share them on social media or hanging your favorites in your home, but what else is there to consider? Here are some of the benefits of having digital files, prints, and albums. When I was in middle or high school, a friend mentioned not having any baby pictures. I couldn’t understand why since my family had so many pictures of me from when I was little. His parents did take pictures of him when he was little, but his house had burned down when he was in elementary school, and any pictures that were in that house were gone. This was before digital photography became the norm, so any pictures they had that were taken before the fire were either copied from photos given to friends and family, or from the school’s database of school pictures. This is the biggest reason why I never think twice about offering digital files. Another reason is that it’s always nice to be able to share your photos with so many friends and family members at once and to have them on your phone whenever you want to show someone, and you can get more prints if you need to years after I’ve given you the files. But only having digital files isn't ideal for every situation. When I got engaged, my grandma, who was losing her memory, asked me every time we talked on the phone what my ring looked like. It was kind of hard to describe, so I texted a picture to my aunt, who I knew visited her often. Still, my grandma would ask me during every conversation what it looked like, insisting that my aunt had never shown her the photo, even though I knew she had several times. My grandma didn’t have access to a cell phone or a computer, so she couldn't see a digital file unless someone came and showed it to her, which we already knew wasn't working out. I printed off a photo and mailed it to her, along with some photos from our engagement session. That way, they could hang on the fridge she passed every day, and she wouldn’t forget what my ring looked like or whose ring it was. So why would you want to order prints if you can just print the digital files yourself? The short answer I give in my portrait guide is that I give you the option to order prints from a professional lab so that they’ll last longer over time and look closer to what you see on your screen. Plus, it’s easier than downloading the photos and re-uploading them to wherever you’re printing them. As for color, I went to Clemson. Sometimes, I would take photos of athletes and their uniforms would look orange and blue instead of orange and purple. Other times, the orange in their uniforms would look like Tennessee orange or Texas orange, or even red. I worked hard in my editing to make sure the colors in my photos looked like what I saw in person. Still, I soon realized that this didn’t always matter if I was printing from the least expensive print source I could get to, because the print could be more yellow or blurry than the file I sent. In college, I'd either pick up smaller prints from a pharmacy in a flimsy envelope, or the larger ones would be mailed to me in a cardboard tube. Not even millimeters separated my prints from whatever could be happening outside. What if a bigger package fell on it? What if I spilled something on the envelope on the drive home? Well, I can assure you that the prints that come from my galleries come from the same lab as the photos that hang on my walls. They came in thick boxes with tons of layers, and you can see that our wedding colors are CLEARLY purple and orange. Let’s go back to my grandma: my dad made my grandma an album of family photos he had scanned, dating back to before my grandparents were married. He said that when he showed her the photos, she was suddenly able to recall specific details about the photos. Around that time, I made my sister's wedding album as her wedding gift, and my dad asked me to make another copy for my grandma. 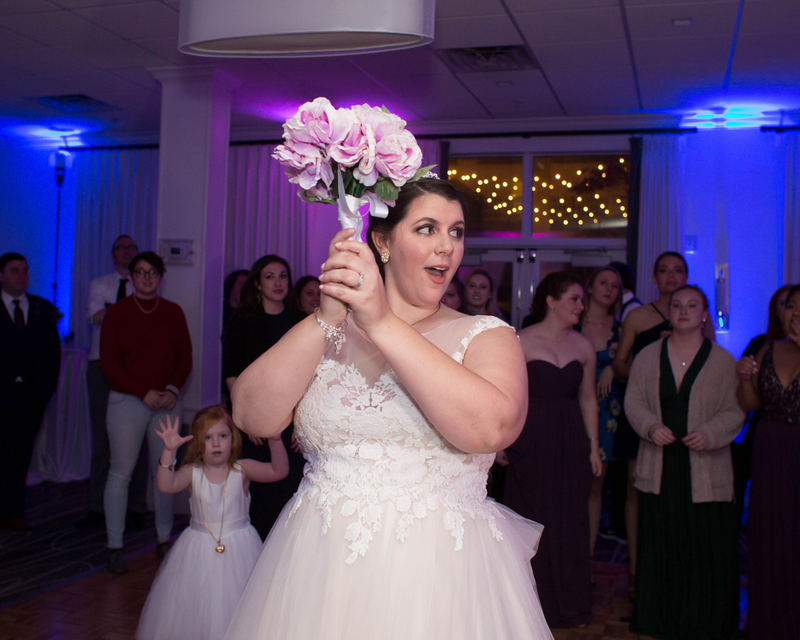 I sometimes had to describe my cousins' weddings to her, even though she was at all of them, and we wanted her to remember how happy she was at my sister's wedding. The album had pictures of the extended family, my sister’s accessories, and the sign they got with their names and wedding date on it. She could pick it up from her coffee table and remember what my sister’s new last name was, the date of the wedding, who was there, and what everything looked like. And someday, my sister and her husband won’t remember that day so well, and they’ll have the album to show their kids. I decided to make my own wedding album because it’s something I like to do. And I did make it…a year after my wedding. It wouldn’t surprise me if other couples planned to make their own and just never did. Unless you’re like me and you’re obsessed with detail shots, you probably won’t have prints of your shoes and rings hanging on your wall, but you would want to have some photos in your album that highlighted some of the important items from your wedding day, like any heirlooms or the lace on your veil that you love so much. You wouldn’t hang pictures that included every guest, but you’d put some of them in an album so you can remember who was there. Plus, looking through my grandparents’ wedding album is so much fun because everything was so different back then, and it’s only when I look at those photos that my family and I see how much I look like my grandma. My approach to delivering photos has always been to serve you the best I can without making things too complicated for you. Everyone has different photography needs, so hopefully this has helped you get a better idea of what your needs are. Thanks for reading! Want to be the first to know when I've posted another post like this one? Click here to join my mailing list! Tori and Michael first met at governor’s school and became friends when they became counselors for the governor’s school summer camp program. After they both graduated from Clemson with engineering degrees, Michael proposed to Tori on a cruise to the Caribbean. 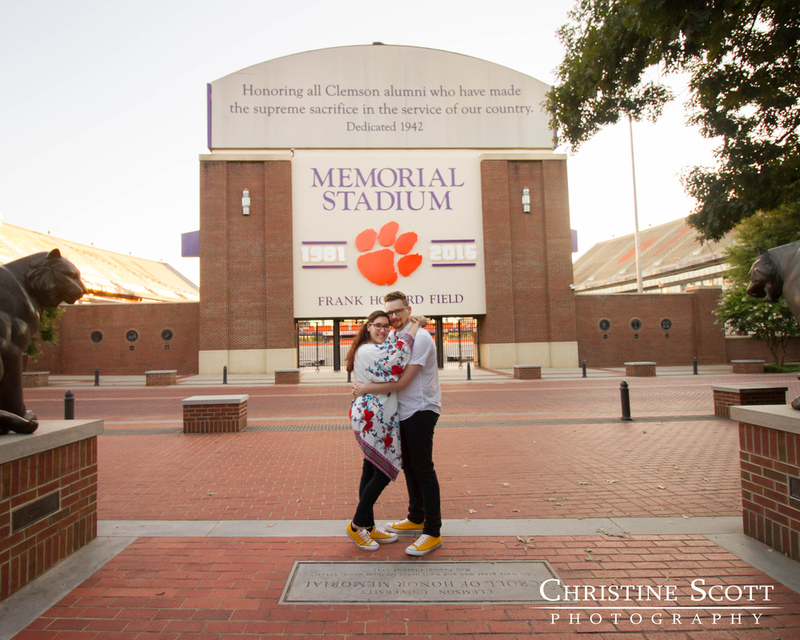 Since so much of Tori and Michael’s story took place at Clemson, that’s where we went for their engagement photos. 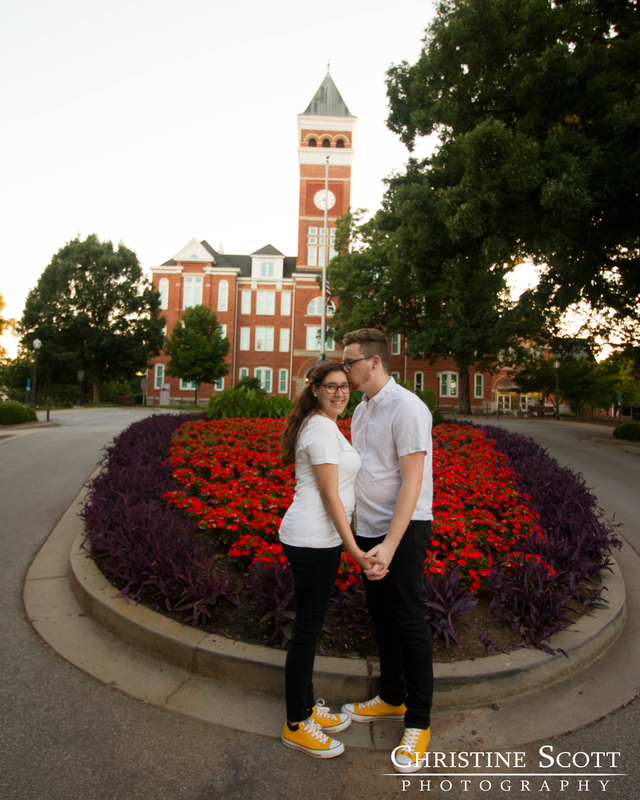 I've done lots of sessions at Clemson and even had my own engagement photos there, but I love how every session I've had there shows a different part of campus that each person wants to look back on. We didn’t just take photos around campus, we went into the botanical gardens and the student organic farm as well. There’s a section of the botanical garden with all desert plants, so until we moved to the grassier areas with palmetto trees, it would be hard to tell we were in South Carolina if you weren’t there to feel the humidity. With a high of 84 degrees that day, it was even hard to remember that it was July. 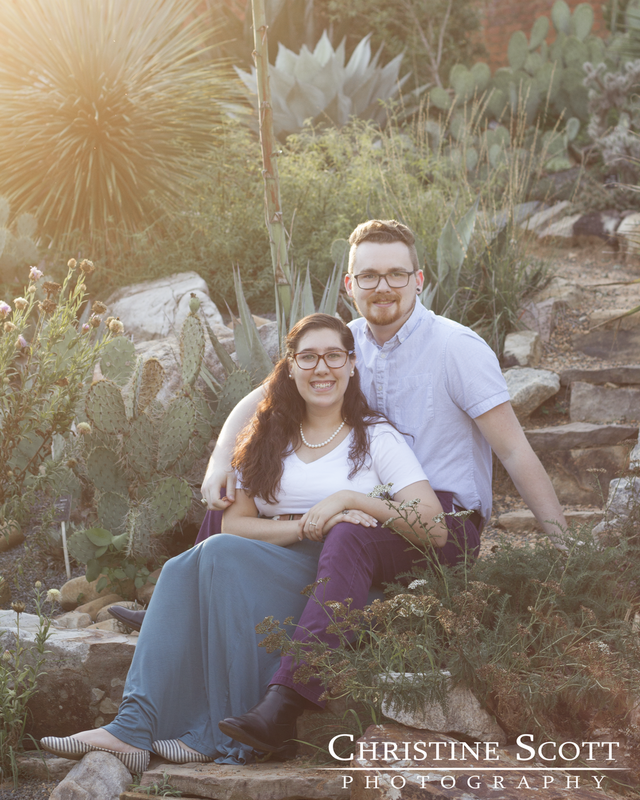 Although their clothes got caught on the cacti a few times before we came up with a new plan for where to stand, I’m happy to say that the only time anyone got pricked was when I set up the shot of Tori’s ring on top of a cactus with a flat top and little tiny spines around it. Luckily, I didn’t really feel them and they came out pretty easily. I thought the outfits Tori and Michael chose were awesome and looked amazing against some of the plants in the area. 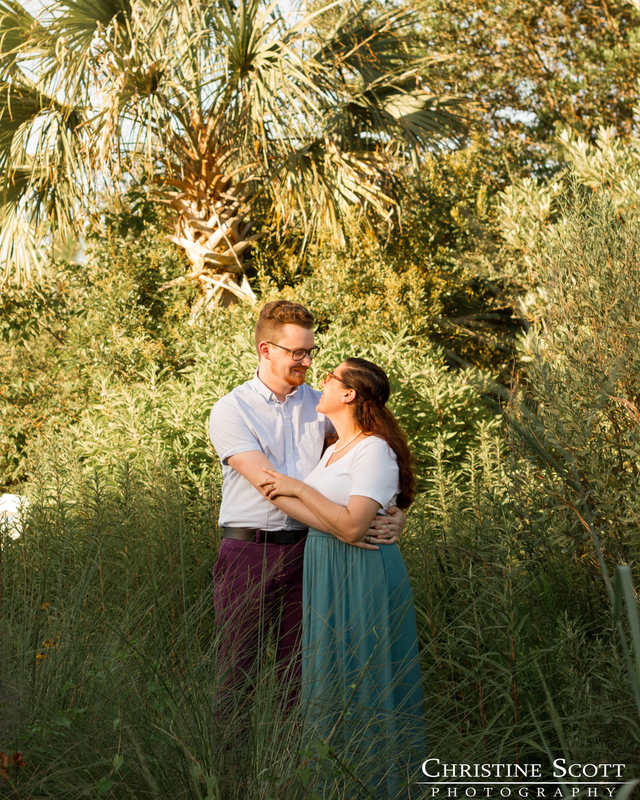 Their first outfit complemented the colors of the desert garden so beautifully. 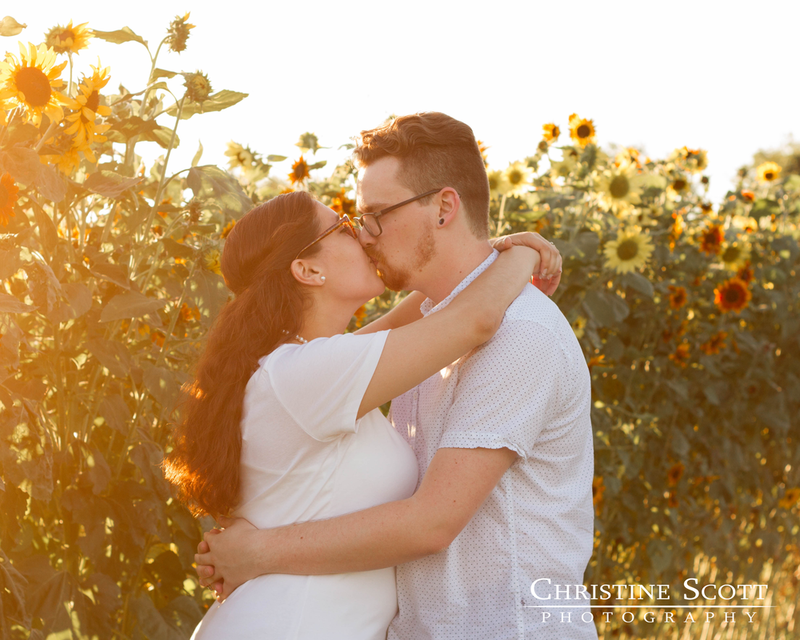 They coordinated their second outfit with the sunflower field in mind, using their matching yellow Converses to complement the sunflowers and stand out from their black and white outfits. 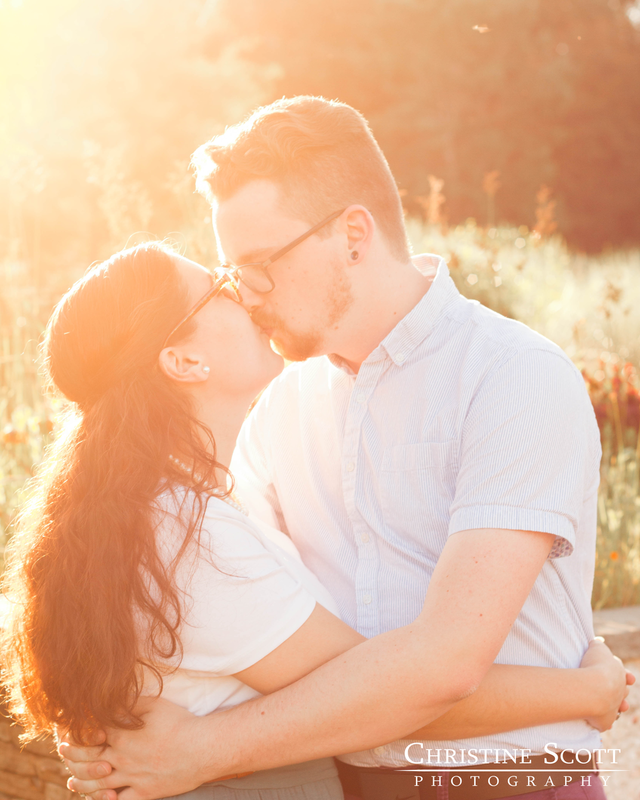 Here are some of my favorites from this Arizona/South Carolina/summer-feeling session! 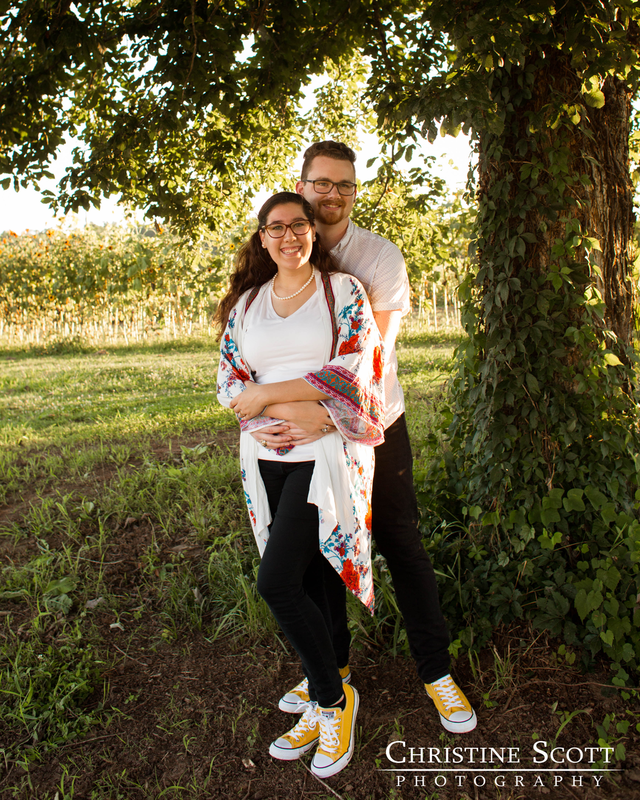 I had a lot of fun with these two and I can’t wait to be part of their wedding day! 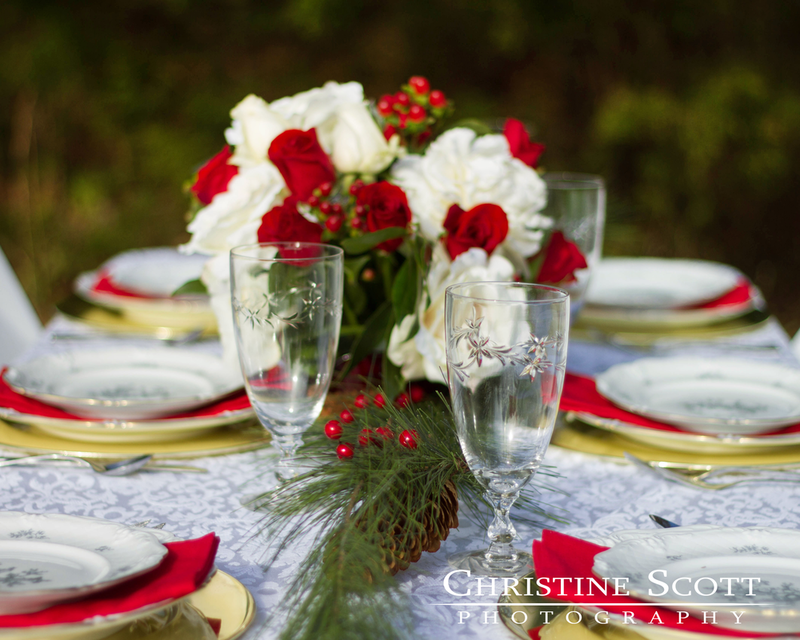 Samantha and Tim's wedding was one of those days that you'd picture if you imagined a peaceful summer wedding in the south. 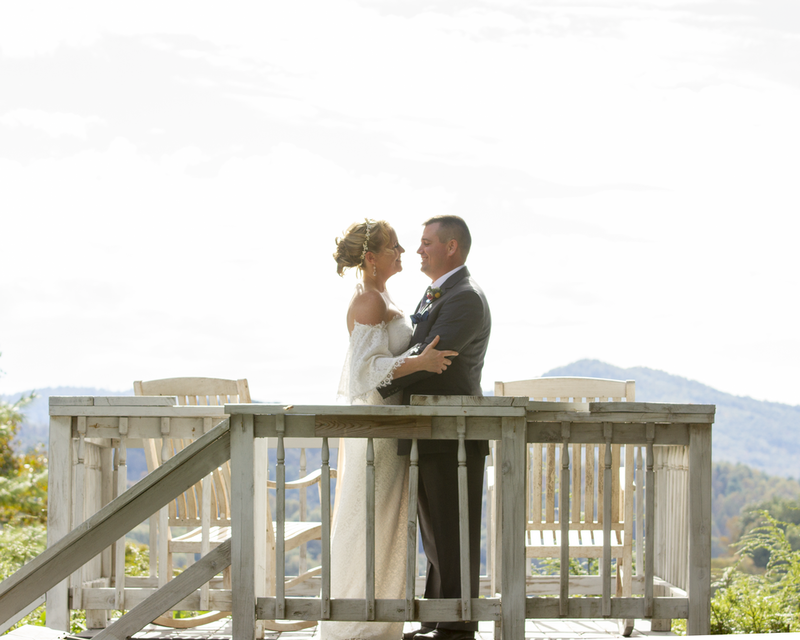 They were married at the Pines at Sheltowee, under the shade of the trees with the Appalachian mountains of eastern Kentucky right behind them. The barn was elegantly rustic on the inside with big windows everywhere to let in plenty of natural light for Samantha's bridal portraits. Her gown had a beautiful lacy train and she carried a bouquet in a pastel pink and blue palette, while her bridesmaids carried baby's breath. 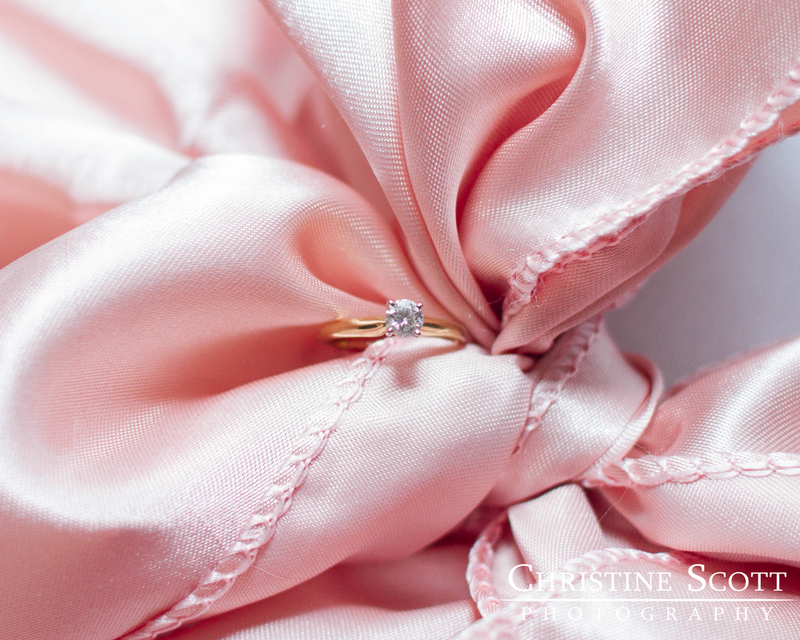 The reception hall, where Samantha's family served food they made themselves, was decorated with hints of blush. The clouds rolled in during the wedding ceremony, keeping the sun off of everyone on this 90-degree day. The rain held off until after the ceremony and it only began sprinkling towards the very end of the bridal party photos. Luckily, the sun was back out during the golden hour, and you know how I love the way golden hour sun lights up hair like Samantha’s. Their dog, Tux, walked down the aisle with Tim’s parents and sat quietly for the ceremony and some pictures. Since Tim is a herpetologist (someone who studies reptiles), his brother and best man mentioned during his speech that he was only allowed to have one room in the new house for critters. It only made sense for their getaway car to have drawings of some of the many animals he’s worked with. I had always imagined that Kentucky would kind of look like West Virginia, where I first started to be conscious of taking “good” pictures of the mountains that would show people who weren’t there exactly how beautiful something could be. After many years of learning to take better pictures, combining a backdrop like that with the joy of a wedding makes me so happy. Samantha and Tim’s wedding perfectly combined those two and more. Here are some of my favorites from this gorgeous Kentucky day! 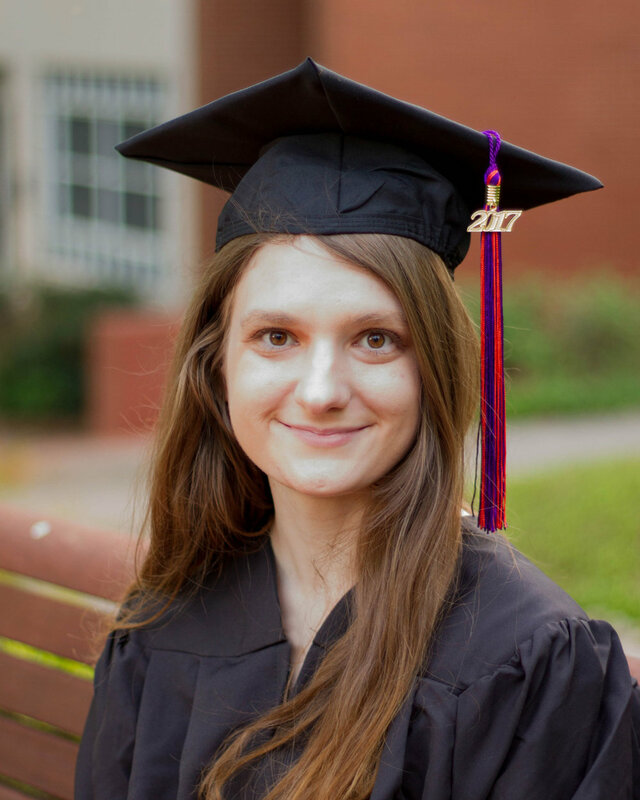 Dress: Bridal and Formal, Inc.
On Thursday, Diana became an alumna of Clemson’s engineering school. On Saturday, she became Andrew’s wife. I did this Clemson couple’s engagement photos on a cold January day in Clemson. 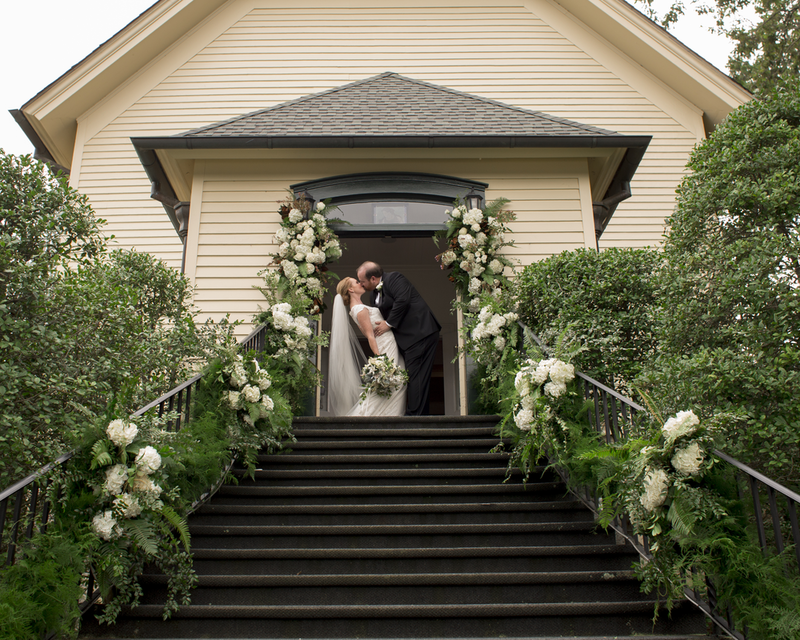 Here are their wedding pictures from a 90-something degree clear day in May! The wedding ceremony took place in the Fort Mill church Diana grew up in and a priest from Andrew’s church delivered the sermon. Diana wore the same veil that her mother and her mother’s sisters all wore on their wedding days, except Diana added a pretty gold headband to it. And how beautiful are these rings? Diana’s yellow-gold rings look so pretty together! Diana’s favorite color is gray, so her bridesmaids wore gray, but most of Diana’s accessories were gold and there were hints of blue in their bouquets, with Diana’s rosary wrapped around the bridal bouquet. After the ceremony, we found a shaded area by a pond near the church for bride and groom portraits, then crossed the border of the Carolinas to Diana’s aunt’s house in Charlotte for the reception. Diana and Andrew love the movie Up, so “adventure” was a common theme throughout the reception. They had a few single-tier cakes from All In, a coffee shop in Clemson where everything tastes amazing, including their cakes. After a night of line dancing and partner dancing in the backyard, Diana and Andrew walked through a tunnel of their family and friends blowing bubbles that came from champagne bottle-shaped bubble containers, which I thought was adorable, before heading to Asheville for their first adventure as husband and wife. 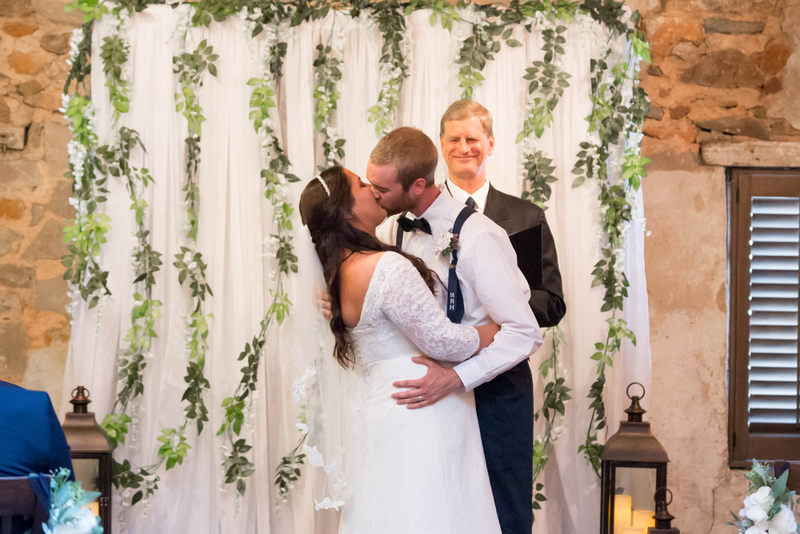 Enjoy the photos of this beautiful celebration of love between two sweet people! 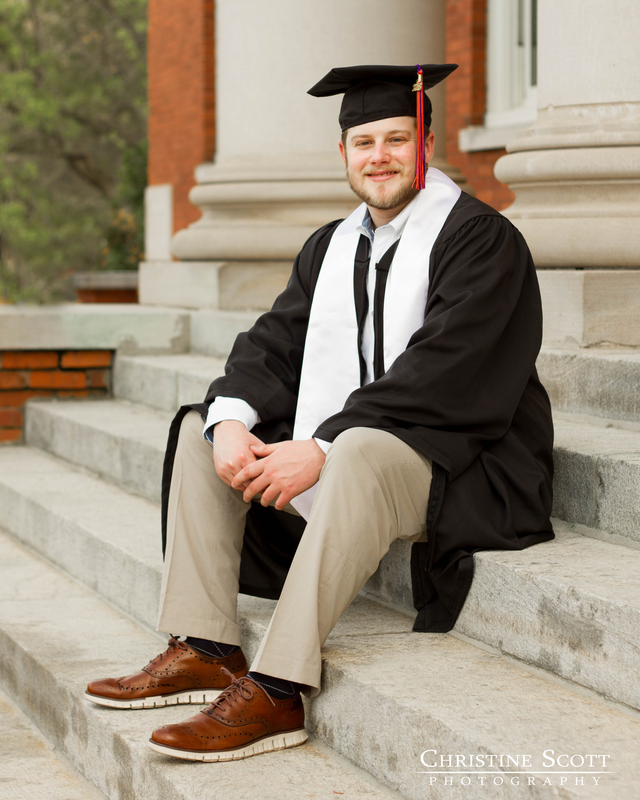 For the Spring 2018 semester, I had 8 Clemson graduation portrait sessions, with 2 more happening after graduation. Here are some of my favorites of each session at the best university. Holly is graduating with a degree in health sciences. She grew up near University of Georgia and became interested in Clemson after they beat Georgia in football. 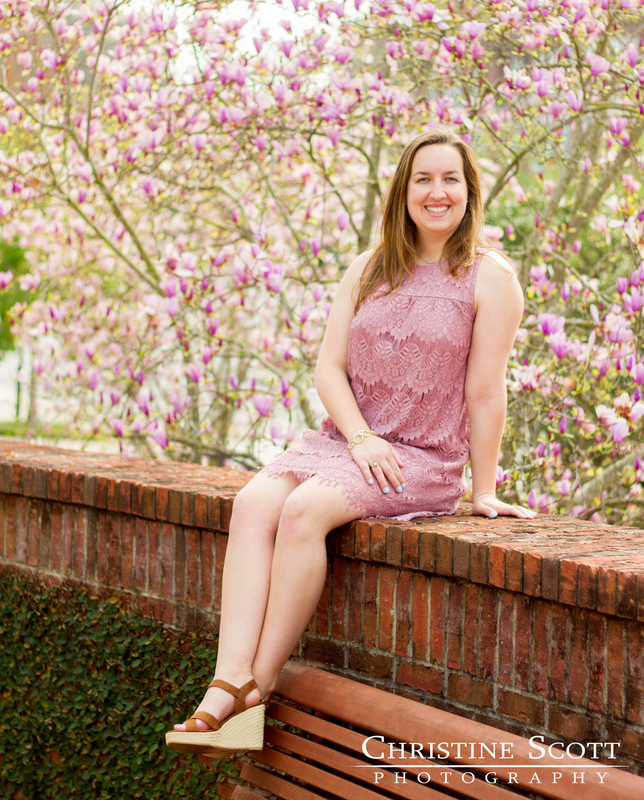 We rescheduled her session for a cloudy afternoon that turned into a bright and sunny afternoon, which made the lighting a little different, and some gorgeous blossoms! Logan is a political science major and Connor is a computer science major. They were also part of my wedding; we all met through Alpha Phi Omega National Service Fraternity. These were also the guys I spent the College Football National Championship with, as well as a lot of that football season. Kinsey is graduating with a degree in chemistry. We arrived at the stadium to find out that the football team had decided to move their practice into the stadium at the last minute, meaning we couldn’t go inside and we had songs like Back in Black blasting through the stadium to pump us up for our other pictures. She did get to come during my next session and get her stadium photos, though! 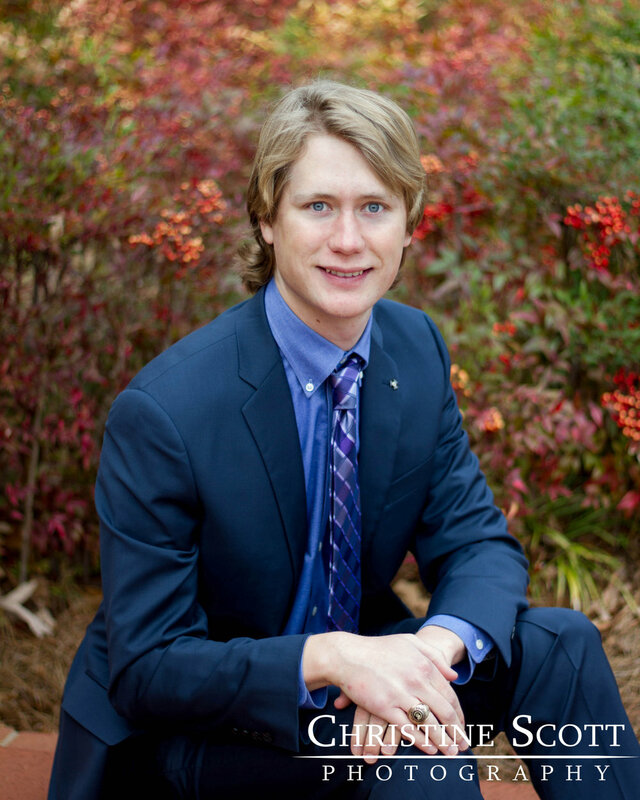 Peter is a management major who will move to Atlanta after graduation. He paid tribute to the football team’s national title from his junior year by wearing a Deshaun Watson jersey for some of his shots around the stadium. Mindy and Megan grew up in Tennessee. Although they didn’t have any family ties to Clemson, they both fell in love with the school and are graduating with engineering degrees. 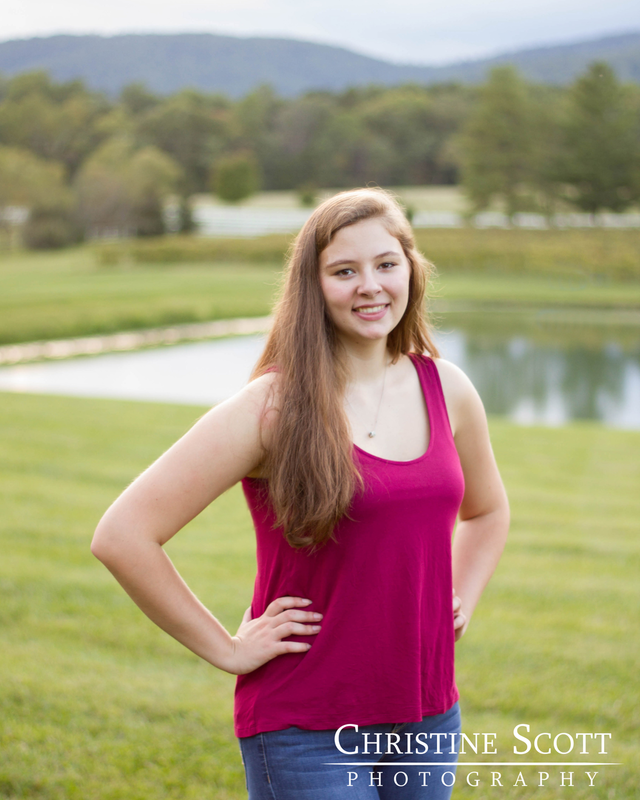 Taron is also a chemistry major and wanted to explore the botanical gardens for the first time during her session. We were originally scheduled to have the session when the trees would be blooming, but it poured down rain on the day we scheduled. Her yellow dress looks so perfect in the gardens though! 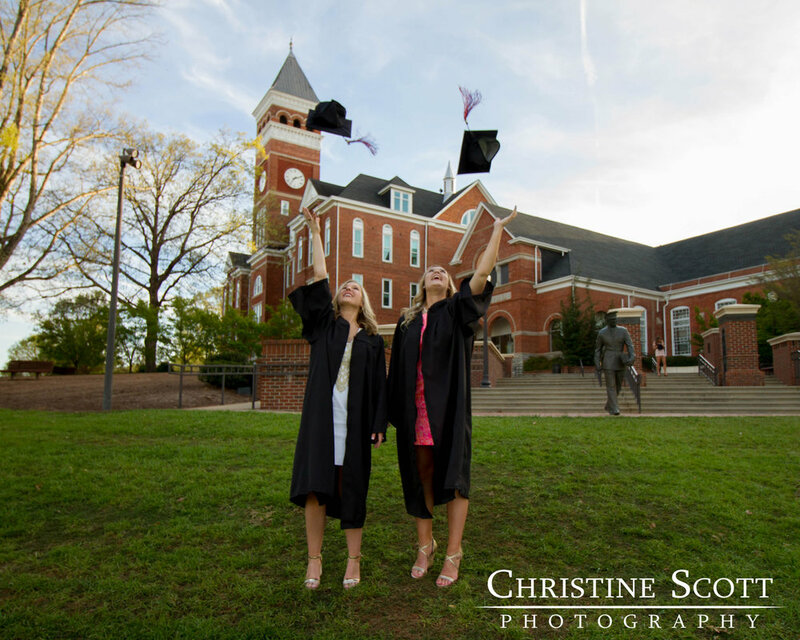 Tracy and Katie have already graduated from Clemson once, but now they’re graduating with their Masters in Business Administration. Since all their MBA classes are in Greenville, they wanted to have a session in Greenville instead, which was a new experience for me! Glenn is graduating with a degree in history. His session was right after most people moved out, so the campus was so quiet that day. Since there were no cars and his girlfriend had come along, I tried a shot of the two of them on the paw print at the 4-way stop. 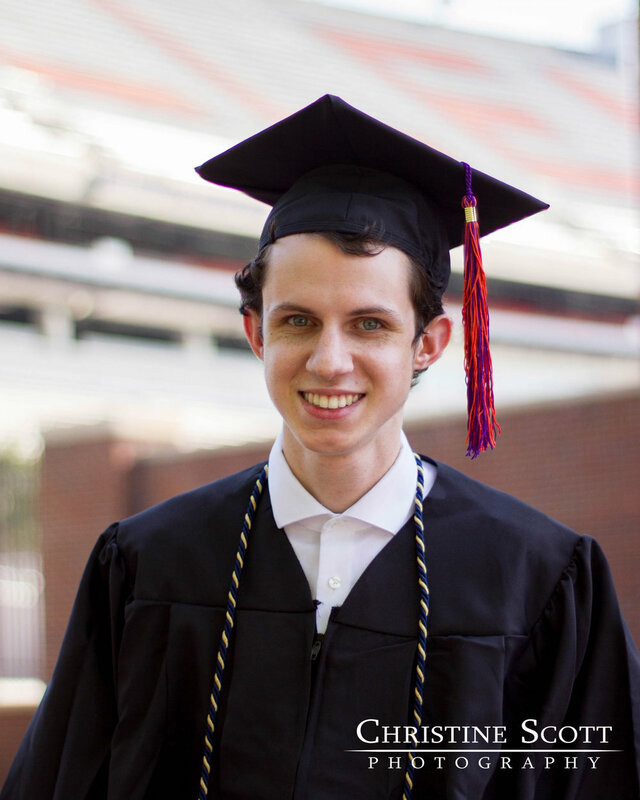 Congratulations to Holly, Logan, Connor, Kinsey, Peter, Mindy, Megan, Taron, Tracy, Katie, and Glenn (and Alexa and Christine, who will be featured once their sessions happen) on their graduation from Clemson! One of my first Clemson portrait sessions was for my friend Tracy when she was crowned Miss Clemson University 2016. Two years later, I got to cover the pageant and see Tara become Miss Clemson University. As the representative for the Clemson Rally Cats dance team, she had such an awesome dance routine to a Gloria Estefan mix, taking home the overall talent award in addition to the crown. I finally got to get to know Tara on what was probably the most perfect day ever for a portrait session—it was a quiet, 65-degree and sunny day with the trees and flowers in full bloom. 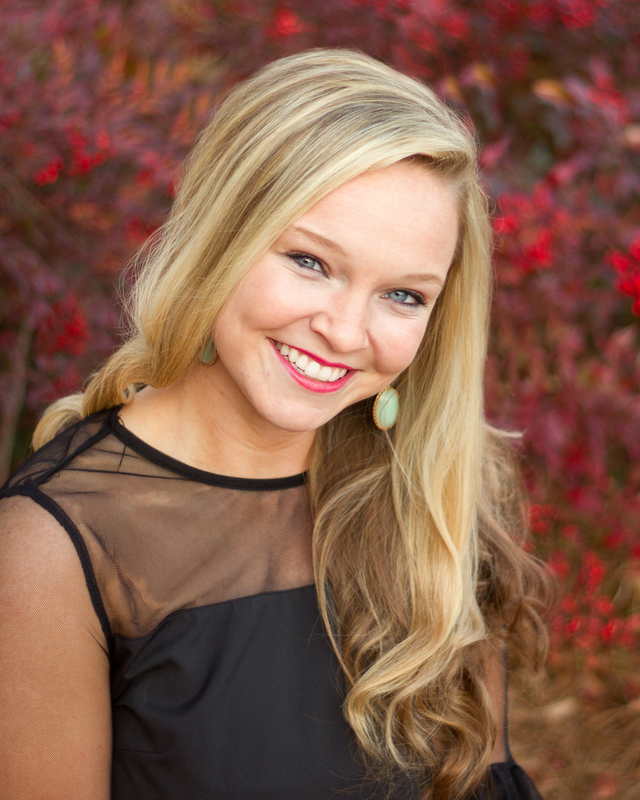 Tara is a health sciences major and a sister of Alpha Delta Pi. She was the 2016 Distinguished Young Woman of America. A few weeks before our session, she was on the basketball court with the Rally Cats when Clemson men’s basketball team made it to the Sweet Sixteen for the first time in over 20 years. A few days after our session, Tara and the Rally Cats went to Disney World to compete at Nationals. Of course we had to have some photos of Tara in the stadium with her Rally Cat uniform, where she also posed for some pictures with excited Clemson fans who had come to take some pictures with Howard’s Rock. When we were taking pictures over by Tillman Hall, there was a group of little girls playing on Bowman Field who kept running up to us, then saying to each other, “I think she’s a REAL beauty queen!” They finally came close enough for Tara to show them the crown. Here are some of my favorites from this beautiful day with this sweet lady! For more information about Miss Clemson University, visit my Miss Clemson University page or contact the Clemson University Mortar Board. Amethyst and Matt first met while working at the same Disney World resort. This past February, Matt got all of Amethyst’s friends in on his plan to propose at the top of the Orlando Eye, a giant Ferris wheel. When the ride was delayed due to a fire alarm going off, the group decided to take some pictures in front of the Ferris wheel while they were waiting. When it was Matt and Amethyst’s turn to have their picture taken, Matt popped the question. Fast forward to the day of the engagement session: seeing the Winnie the Pooh characters react to a couple saying they’re engaged is the cutest thing ever. We started the session on the beaches by some of their favorite resorts. Yes, we had a beach and Cinderella’s Castle in the same shots! That Winnie the Pooh song that says “and the rain rain rain came down down down” is a perfect description of what happened partway through. Amethyst and Matt pulled out their Mickey and Minnie umbrellas, which was not only adorable, they looked especially gorgeous when a little patch of golden hour sun peeked out for a few minutes. To top it off, we saw a rainbow for a minute! Luckily, there were lots of gazebos in the area, so Matt and Amethyst could stay dry while dancing to Disney songs. Keep an eye out for a hidden Mickey in one of the gazebos! I don’t normally shoot after the sun goes down, but we were in Disney. We headed to Main Street and watched the fireworks and light show at the castle. I asked Matt and Amethyst if they wanted some pictures with it. They said to wait until the grand finale, when there would be the most fireworks. There may have been a ton of people around, but the rush of catching the right moment was incredible. I knew as soon as Matt and Amethyst told me where they wanted their engagement photos that this would be so much fun. Hope you love looking through these photos from the most magical location! 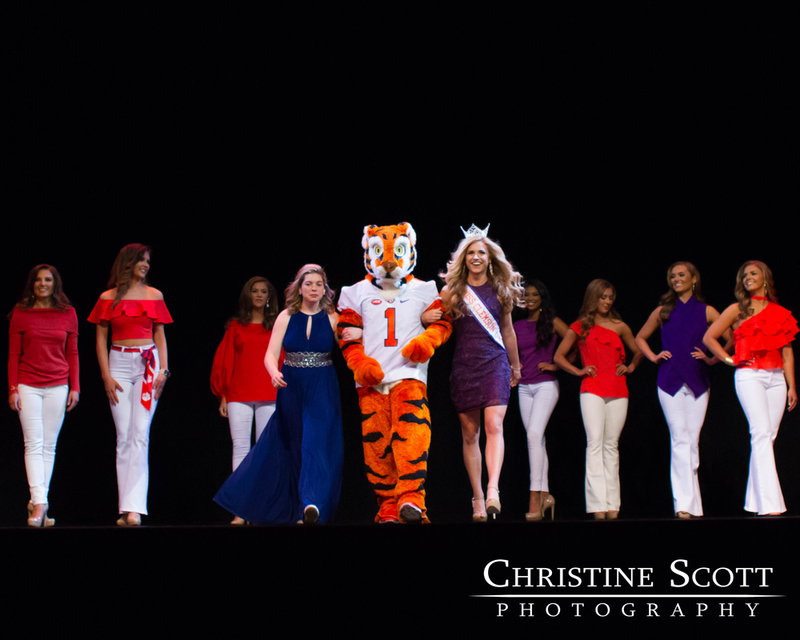 I had the pleasure of shooting the Miss Clemson University pageant once again! This time, I'm sharing some of my favorite photos of each contestant in a blog post. 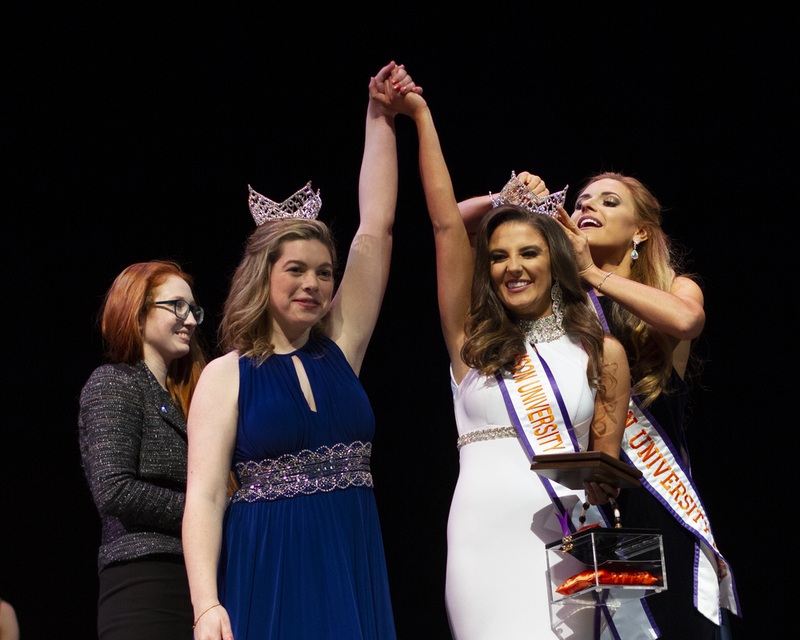 After the opening dance in which all 19 contestants introduced themselves, Miss Clemson University 2017, Brooklyn, entered with the Tiger and Miss Clemson Life, Megan. Brooklyn was an MC for the event with Rachel, who was Miss Clemson 2016, which led her to become Miss South Carolina and the runner-up for Miss America 2016. 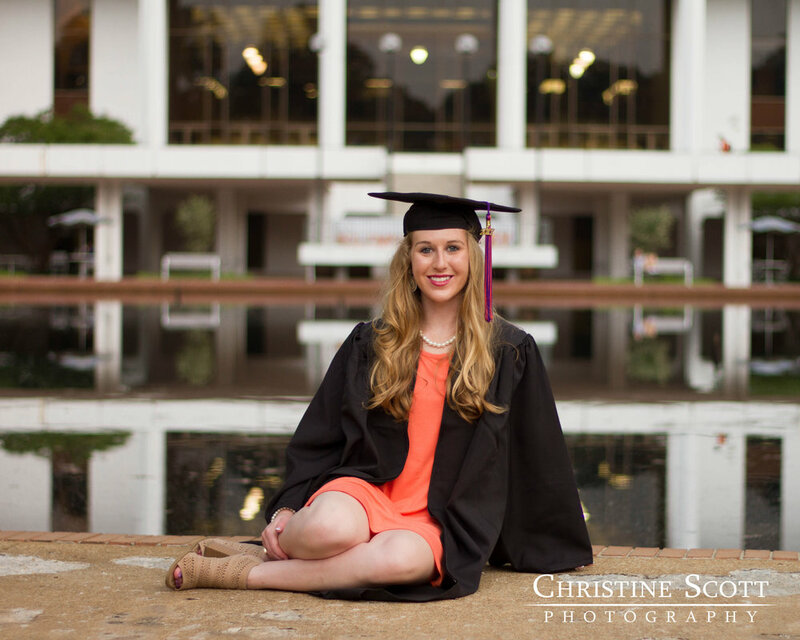 (for information about purchasing photos, visit my Miss Clemson University page). I had the pleasure of meeting Caroline a few weeks before the pageant to do her pageant headshots. She was given the Miss Congeniality award at the pageant. Reese represented the Clemson cheerleaders and performed the cheer routine to Tiger Rag, the Clemson fight song. 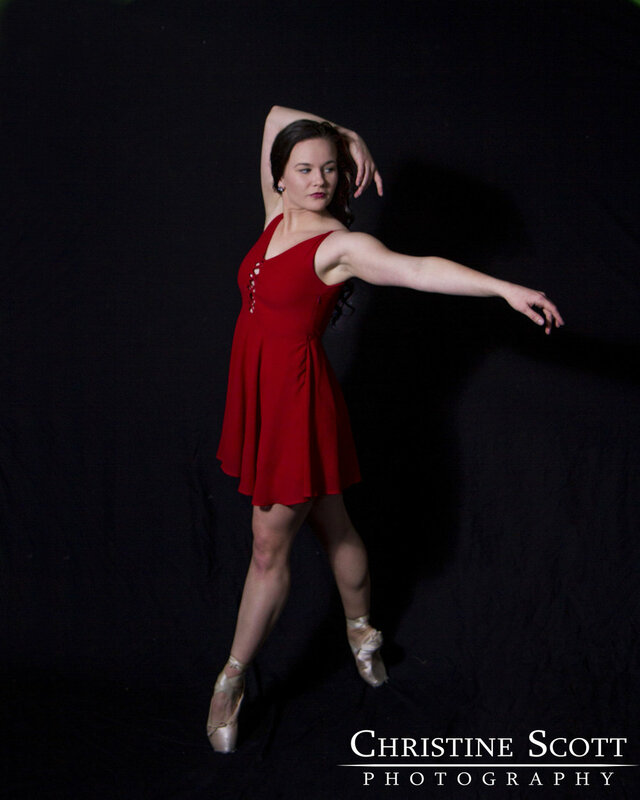 I'm loving this shot from Johanna's dance! She was awarded the 4th runner up. Laney looked like she was having so much fun with her belly dance routine! I had to post a shot of Kyndall's dress from the back because that cape is just so cool! Alyx sang Orange Colored Sky with an orange jumpsuit. Perfect for Clemson! I also did Margaret's pageant headshots a few weeks before the pageant. She received the People's Choice award at the pageant. As a lover of all things vintage, I loved Carlyle's evening gown with her hair! Tiffany's gown looks so sparkly in the stage lights! Shea represented Clemson Dancers, the only organization represented at the pageant that I was part of during my time at Clemson. Katherine played one of my favorite Disney songs (When You Wish Upon a Star) and had the perfect dress to go with it! Claire had such a fun Irish dance for her talent! I have so many favorite photos from Logan's dance routine! She was the first runner up and had the most ad sales. This is my new favorite evening gown photo! Morgan was given the philanthropy award. It's not my best picture of Cara's talent, but it's the one that shows off her outfit the best. Nicole's dance routine and gorgeous white evening gown helped get her to 3rd runner up as just a freshman. Abigail also sang jazz in a Clemson colored jumpsuit, wearing purple and singing Fly Me to the Moon. The interview portion of the pageant took place earlier in the day, so I didn't see the interview for which Makenzie was given an award. She also was named second runner-up. Brooklyn made her final walk as Miss Clemson University. She was joined onstage by her dad and brother. The contestants returned to the stage for the award ceremony, which started with the first-ever crowning of Miss Clemson Life, Megan. Brooklyn passed on the crown she was given for Miss Clemson University 2016. After all of the other awards were given, Tara of the Rally Cats was crowned Miss Clemson University 2018! To see more, and for more information on purchasing photos, visit my Miss Clemson University page. One day at Clemson, Andrew and Diana walked hand-in-hand through President's Park. Andrew did not know at the time that superstition says that means they'll be together forever. This time, they held hands and danced through the park, knowing their wedding day will be here before they know it. I've done lots of portrait sessions around Clemson, and I had my proposal, engagement, and wedding pictures at Clemson, but this was my first time shooting an engagement session at Clemson, so this one holds a special place in my heart. It was also my first time doing a session in January; I don't know what colors are the most festive for January, but I'm pretty sure that Diana and Andrew wore them for the session, and Diana’s purple coat is so perfect for a session at Clemson. At such a cold time of year, there were no leaves on the trees to hide some of the buildings on the main part of campus, so Tillman Hall could be in the background of our photo from the steps of Sikes Hall and the photo of Diana’s yellow-gold and sapphire engagement ring. Diana has been on Clemson’s rowing team all four years of college, so we took some pictures down at the lake on the dock with a tiger paw painted on it. With a high of 37 degrees that day, we couldn’t see or hear any people or boats, making it a peaceful time for Diana and Andrew to snuggle up in a blanket on the dock and watch the sun go down over the water. 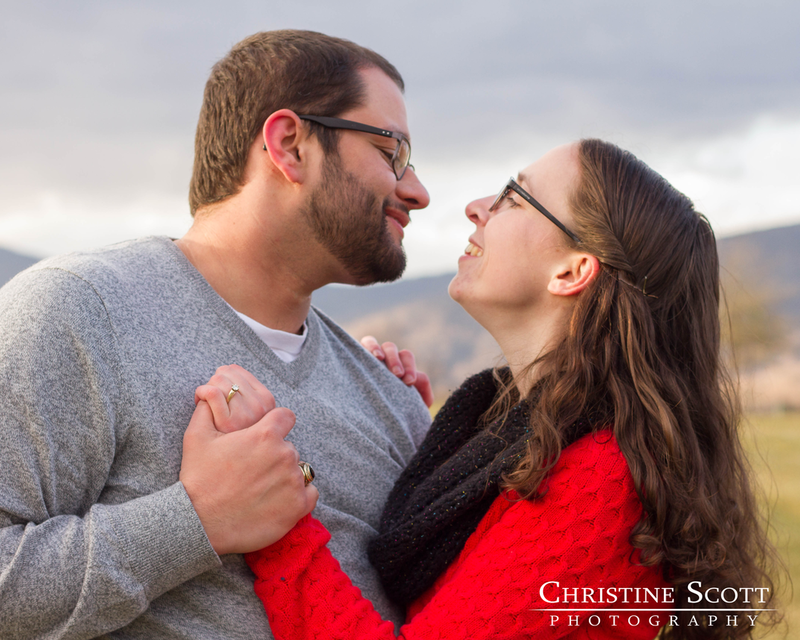 Here are some of my personal favorite photos from Diana and Andrew's engagement session. After having so much fun with them at their session, I'm even more excited now to be part of their wedding day! I always watch the forecast closely and frequently in the week prior to a session, and Katherine and Anthony's session was no different. Yet somehow, I woke up, saw that the forecast had changed from "cloudy" to "partly cloudy," then looked out the window to see the roads covered in snow! Nobody in the area was expecting this to happen. Luckily, it melted enough to clear the roads so I could meet Katherine and Anthony for the session. This would be the first session I'd ever done in the dead of winter and it would be in Virginia, so I knew this would be my coldest session yet. What I didn't know was exactly how cold it would be. Although the snow all melted before I could get a shot of Katherine's ring in the snow, it was still cold enough for us to take pictures in front of a frozen pond. After meeting through their friends a few years earlier, Anthony proposed to Katherine in Washington DC on the steps of the Jefferson Memorial, which faces the Washington Monument. They wanted to have their engagement photos in the Virginia Blue Ridge Mountains, so in the week between Christmas and New Year's, we met up in Crozet, slightly west of where Katherine and I both grew up. Their outfits were the perfect winter engagement session outfits; the colors were so classically wintery, Katherine's red sweater was a perfect fit for that time between Christmas and New Year's Eve, and Katherine's mom made the scarves that both of them wore to the session. 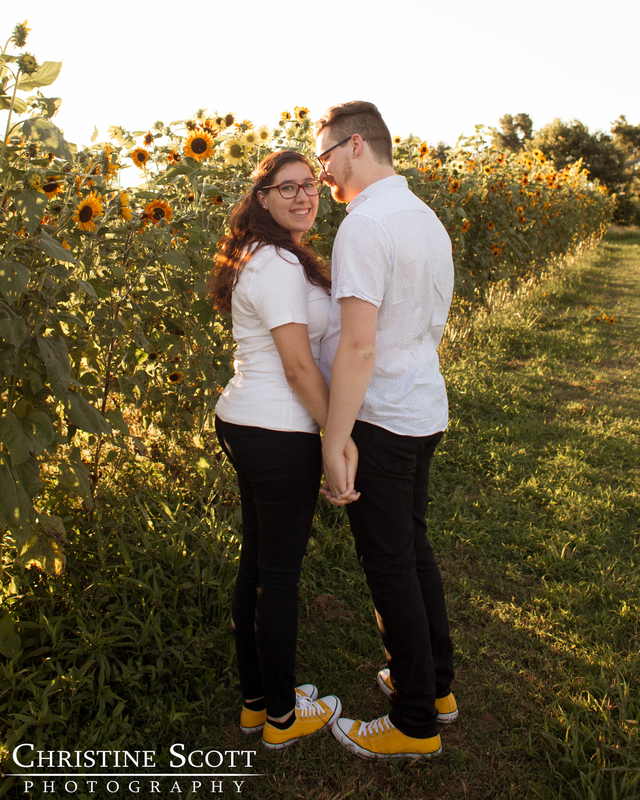 Katherine's yellow-gold ring was covered by her gloves for a good part of the session, but it made for some cute photos of her trying to keep Anthony's hands warm. We ended the session a little earlier than I usually do because the windchill was so brutal (by our Virginia standards), but the golden hour lighting kept us out for just a few more pictures. I'm so glad we were able to brave the cold at least for a little while and that the snow didn't keep us from driving to these mountain views. Since apparently everyone else in Crozet decided to stay inside that day (not that we can blame them), we had this gorgeous landscape all to ourselves. It's always an honor to be part of putting these sweet moments into pictures, but it's even more special in the wide open with absolutely nobody else in sight. I can't wait to come back to Charlottesville for the next part of Katherine and Anthony's story! Another year over, a new one just begun. 2017 was quite the year for pictures! Clemson football won the national championship in January, I shot the Miss Clemson University pageant, Dan and I got married in July and took our honeymoon to British Columbia, there was a total solar eclipse in August, and there were all sorts of awesome people in front of my camera in between. So what's happening in 2018? I will be shooting the Miss Clemson University pageant again this year! If you're competing and you don't have professional headshots for the program yet, let me know and we can set up a session. Thank you so much to everyone who's supported me in my photography so far. Whether you've chosen me as your photographer or you've given me some words of encouragement, it means so much to me. I wouldn't have reached this point without your support. Here are some of my favorite photos from everything I shot in 2017. I'm always striving to be better at what I do, and I can't wait for all the pictures 2018 has in store!